This is my eighth blog post out of nine, about the eight weeks I spent in Thailand with my girlfriend Emily. 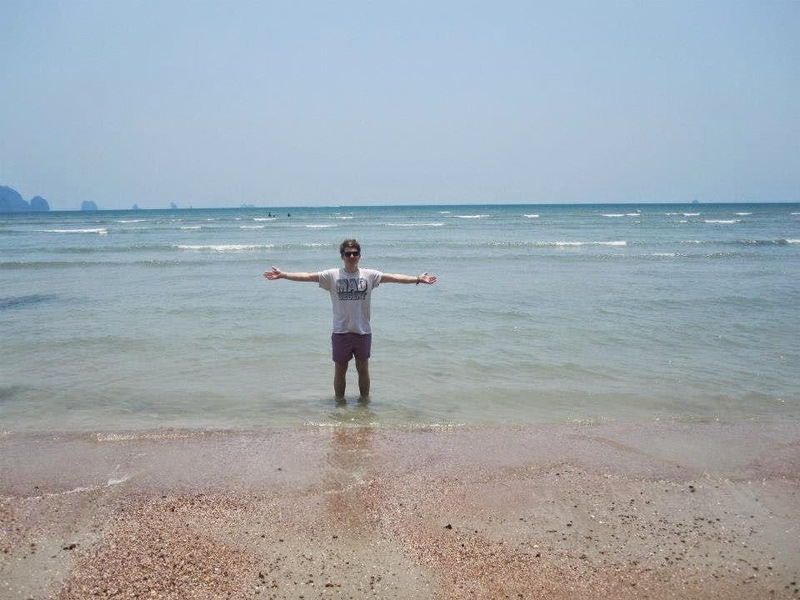 You can read about our time in Bangkok here, Chiang Mai here, the Elephant Nature Park near Chiang Mai here, Chiang Rai here, Pai here and Sukhothai & Ayutthaya here and the Andaman Coast here. My birthday fell during Songkran Festival [Thai New Year], but also on the date of a full moon. As we were going to be in that general area, it seemed crazy not to celebrate my birthday at the infamous Full Moon Party in Koh Phangan! 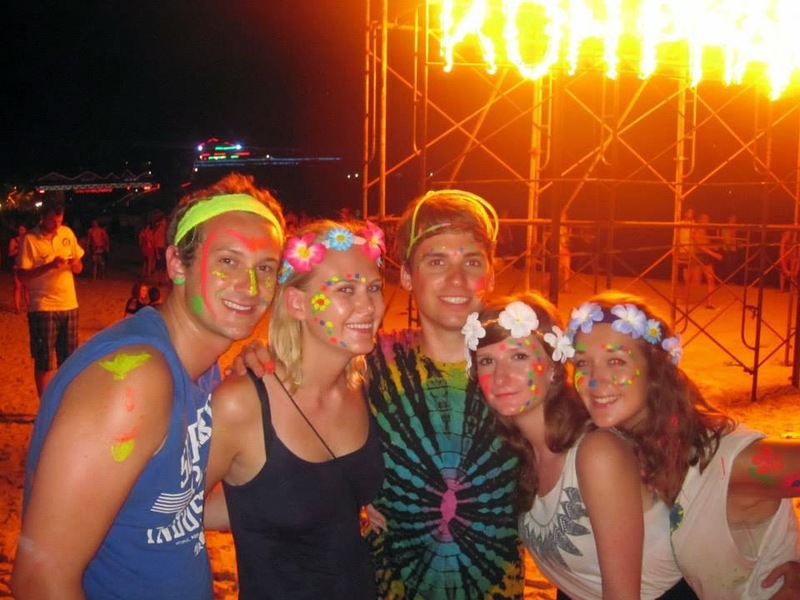 We asked around to find out whether Full Moon Parties were worth going to or not and if they are safe. 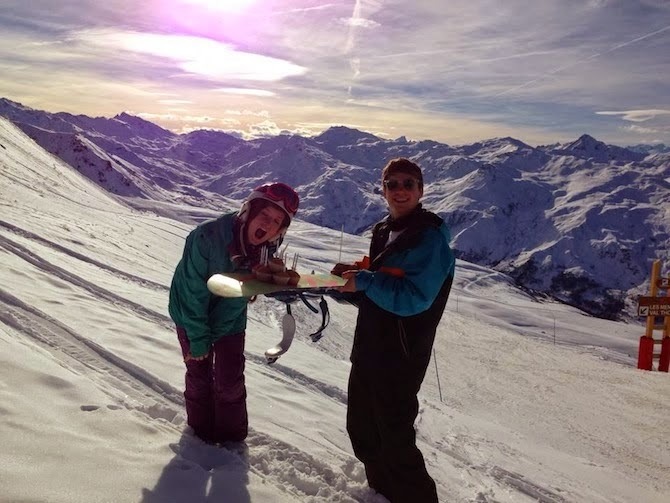 It generally seemed that anyone who had been to one said it was a great experience and the people that had horror stories or advised us not to go, were people who hadn't actually been themselves! Our friend Janie's birthday was the day before mine, so we had some lovely food and drinks at a restaurant on the other side of Koh Phangan, where we were staying. The next day [my birthday!] we had a relaxing day on the beach, ready for a big party night ahead. 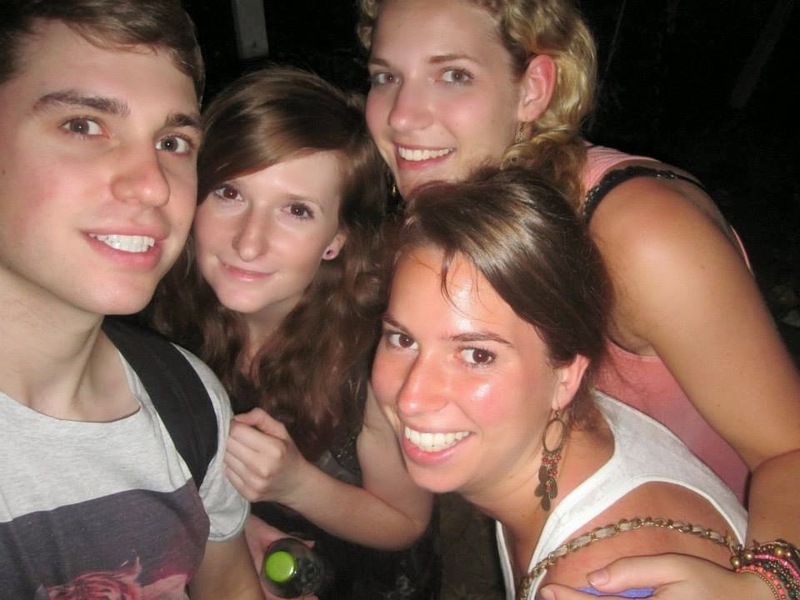 Myself, Emily, Sam and Janie who we met in Pai and my friend Jess from home all travelled to Haad Rin Beach [also called Sunrise Beach] in a taxi. We were the only people in the taxi for most of the journey and played some drinking games on the way there, with drinks we had bought with us from good old 7-Eleven. 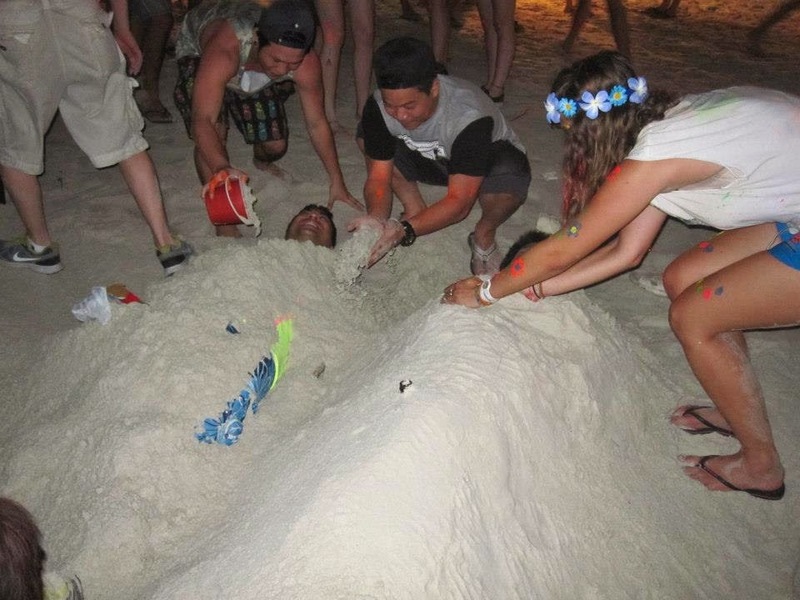 Jess is on the right helping give a man buried in sand some nice sand boobies! When we arrived in the Haad Rin area, we were immediately hounded by people on market stalls, trying to charge us loads of money to paint florescent patterns on us. We walked a little further and found a stall charging a fairly small amount for a pack of six different coloured florescent paints. 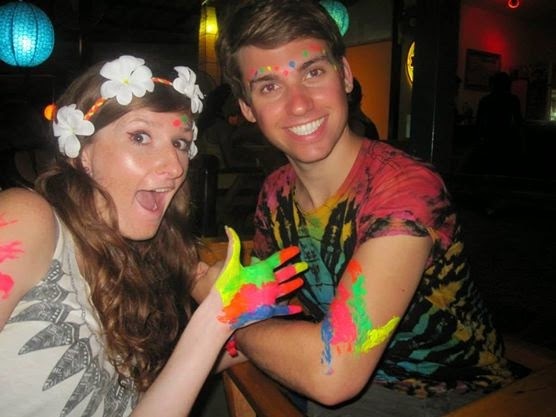 We thought this was a great option and headed to a bar for a drink and to paint ourselves and each other as brightly as possible! There is a small fee to enter the beach, which goes to the local government and contributes to the clean up effort after the party. You get a rubber wristband in exchange for your fee, which we were quite surprised about. It was nice to get a souvenir from the night and it'll look great in my festival wristband frame! We spent a few hours wandering up and down the beach, stopping every so often for a dance, to have a drink or to see some other funny thing going on. In one place there was a big water slide set up, running down the side of a bar. It was great watching people drunkenly throw themselves down this. 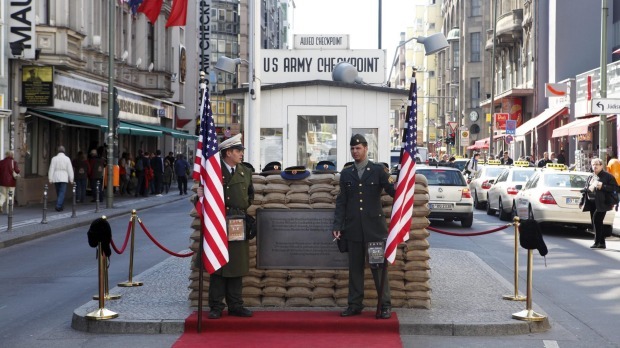 We found it entertaining that there were designated sleeping areas, with marshals watching out for you. This seemed to be right in the centre of the party action, where you'd have to be quite out of it to get some sleep! Conscious that we needed to hunt out a taxi and travel 50-minutes back to our hotel, we called it a night at around 3am. Some of the after-parties go on until lunchtime the next day, but getting back after 4am was plenty late enough for us. 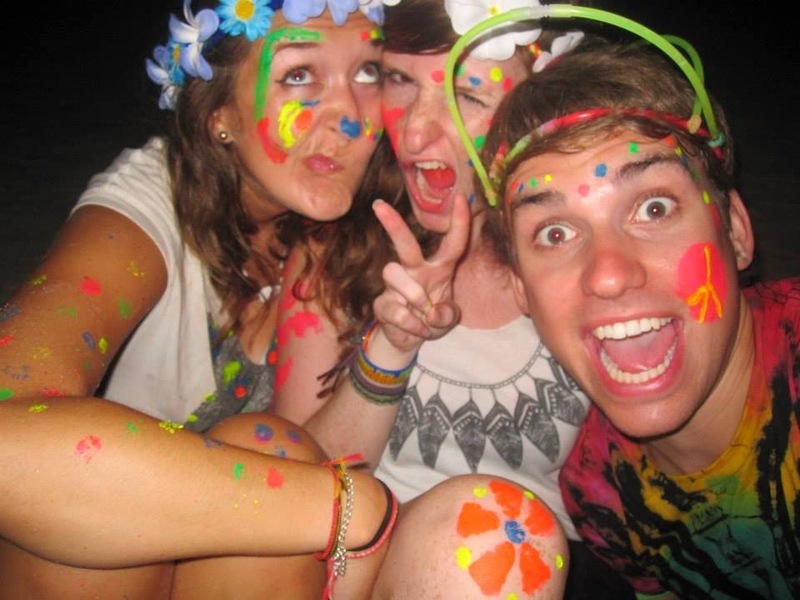 We had a lot of fun and I'd recommend going to a Full Moon Party if you get the chance. It's not mindblowingly amazing by any stretch of the imagination, but it was definitely good fun and something to tick off the bucket list! Cheesy photo with my snazzy glow stick hat! We took some precautions to stay safe, including leaving our valuables safely locked in our hotel room. We took a camera, but had this strapped to my shorts when not being used. We took just enough money each to buy a few drinks and to get a taxi home. When we were there we only drank drinks that we saw the seal being broken on and watched them being poured. We stayed together as a group wherever possible and didn't go off on our own. We also didn't go crazy with the amount we drank; we just had enough booze to have a good time and enjoy the mayhem! We didn't encounter any problems at the party, but I can see how you might if you drank too much and weren't being sensible. Having been to many festivals, including big dance music festivals, I didn't think the atmosphere was much different to any festival I have been to. There was lots of loud music, people having a good time and you can get yourself into trouble if you drink too much, just like anywhere else. Bad things do happen at Full Moon Parties, for example you do hear of muggings, but I think on the whole it's a safe and fun experience. This is my seventh blog post out of nine, about the eight weeks I spent in Thailand with my girlfriend Emily. You can read about our time in Bangkok here, Chiang Mai here, the Elephant Nature Park near Chiang Mai here, Chiang Rai here, Pai here and Sukhothai & Ayutthaya here. After a soul-destroying 17-hour sleepless bus journey from Bangkok, we were delighted to finally make it down to the south, for a month of beaches and islands. We arrived in Krabi town, where we were under the impression there would be a lovely beach waiting for us. It turned out that Krabi itself just has a river, so we caught another taxi to travel further along the coast, to Ao Nang. Ao Nang is a beach resort and is more geared to holidaymakers than backpackers. 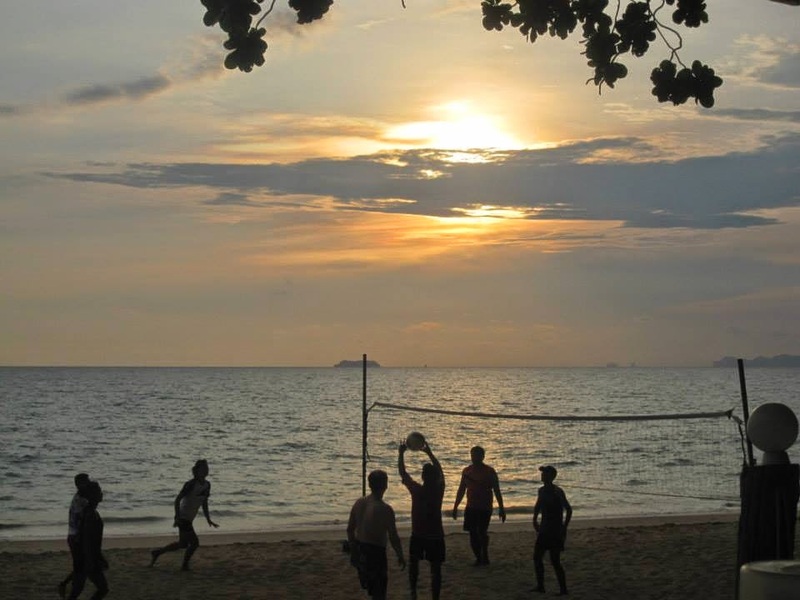 As we quickly discovered, in Ao Nang you could be in just about any other beach resort. We were so happy to be able to swim in the sea and sit on the beach, that we loved the first couple of days, despite the area being not all that exciting. It was really lovely to meet up with Sam and Janie again, who we first met in Pai and last saw in Chiang Mai a few days previously. First paddle in the sea! On our second day, after a very long sleep to make ourselves feel human again after the long bus journey, we headed back to the beach for a lovely day in the sun. 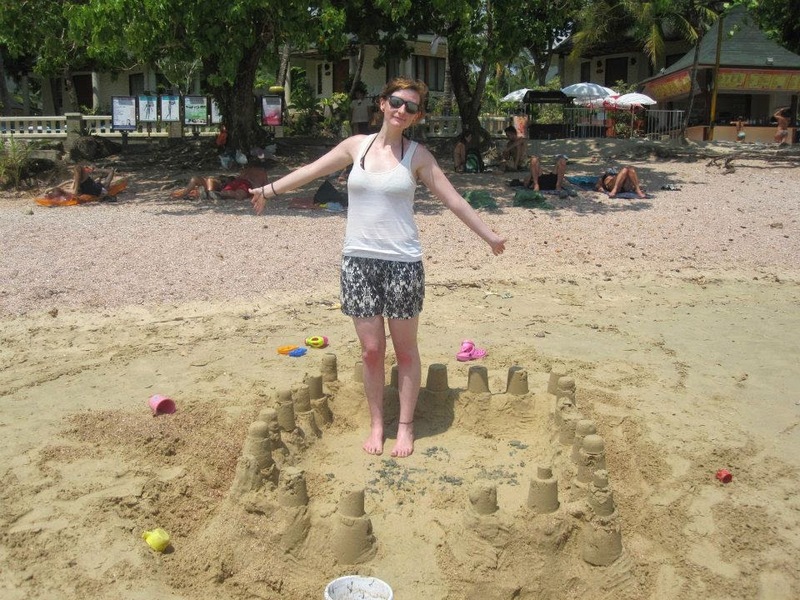 We bought a bucket and spade and looked very silly building a sandcastle, while all the other adults sun-bathed around us! A little girl called Liv from Holland helped us make it too. Even though we had been so careful apply sun cream, we both ended up getting very sunburnt whilst making the sandcastle and ended up feeling very sorry for ourselves! We were going to go to the next beach along by long tail boat the next day, but ended up taking it very easy in the shade instead, due to our sore red bodies! 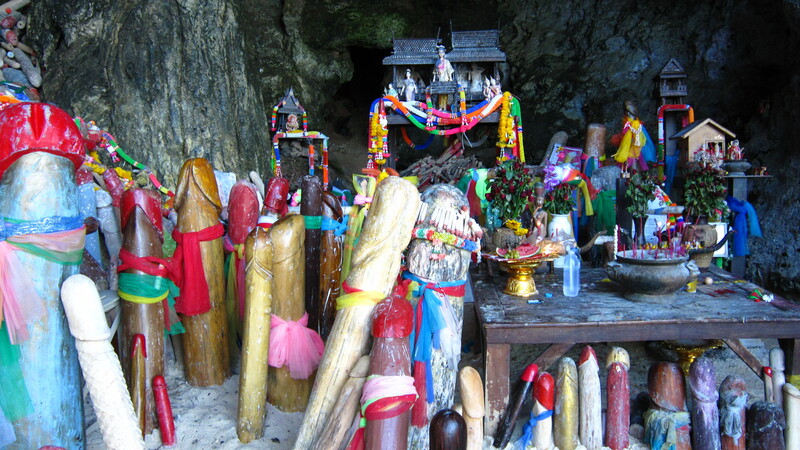 The next beach along is called Railay and is home to the Phallus Shrine. This is where fisherman have left many phallus objects over the years, and apparently still do, as a mark of respect to a princess who is believe to have died here. They believe that by doing so, the princess will bless the water with plentiful fish for the fishermen! There is a huge selection of restaurants and bars in Ao Nang, but the prices were a lot more than we were used to, as it is largely geared towards holidaymakers. Ao Nang wasn't a bad place to start our relaxing time down in the south, but we were keen to move on to our first island, where we hoped it would be a little more interesting and less packed with tourists. We travelled by minivan and boat to Koh Lanta, which took around five hours. We headed to a guest house called Somewhere Else, where Janie and Sam had reserved us a room. This is set next to Long Beach on the island. We stayed in a lovely little budget hut and spent our days chilling in beach huts, a few feet from the sea. The beach and sea was nice, but not outstanding, but it was lovely to relax, do very little and have a chance to read lots. The clubhouse at Somewhere Else served great food, which we mostly ate in the beach huts and it also had a table tennis table, which we made great use of! 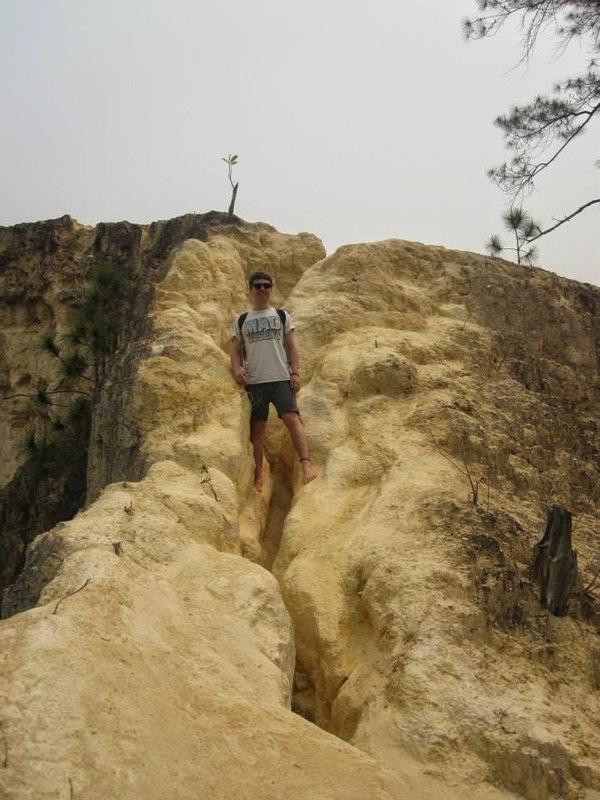 Although we didn't explore a huge amount of the island, we didn't think it was particularly interesting and certainly not particularly attractive on the most part. The roads and streets are lined with litter and there is a general feeling of the island not being generally well looked after. There were many bars and restaurants in the area we were staying, but barely any people in any of them! We weren't there in peak season, but nor was it low season, so we were surprised that there were so few people around. We made the most of it though and had plenty of drinks and made our own fun. It was great with four of us, but if we had just gone as a couple or on our own, it might not have been much fun with so few people around. Koh Lanta was a nice and relaxing place to stay for a few days, but I wasn't particularly impressed and wouldn't really recommend it. 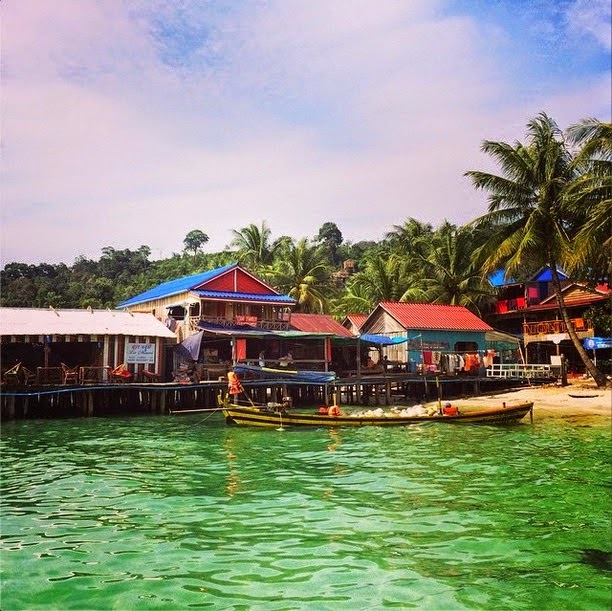 Our third destination on the Andaman Coast was the infamous Koh Phi Phi. This is a notorious party island, boosted in popularity by The Beach movie, starring Leonardo DiCaprio. 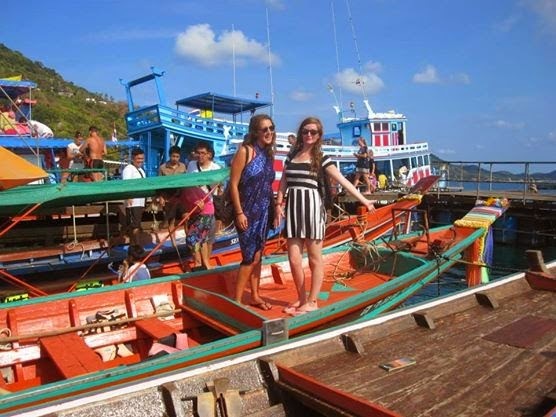 It was a fairly short and easy boat journey from Koh Lanta to Koh Phi Phi and we paid a small fee when entering the island at the harbour, which they say goes towards keeping the island clean. On the whole, this seems to be a good system, as the island is mostly nicely kept. Saying that, there is a lot of rubbish left on the main party beach each night, so it's not a pleasant place to go swimming or relax in the morning. 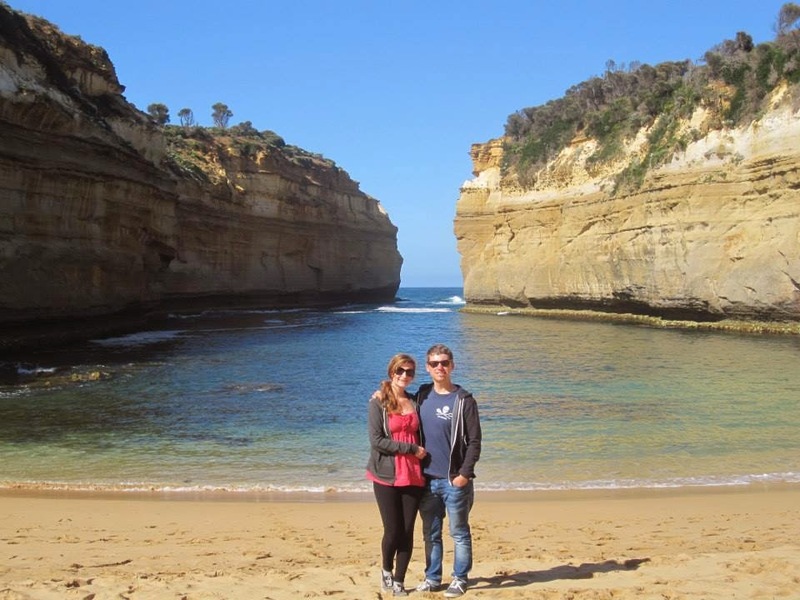 We stayed at a guest house called Rock Backpacker, in a room next to Janie and Sam. This guest house has a few dorms, but we opted for two double rooms, to give us more privacy and only for a small cost more per person. We were pleased to know that this guest house is a designated safe place during a tsunami, due to it's high location and good structure. Lots of tsunami emergency measures are visible on the island, after it was devastated back on Boxing Day 2004. The four of us went out on our first night to see one of the many fire shows on the main tourist strip, Tonsai Beach. This lasted for at least two hours and had a great variety of fire acts. 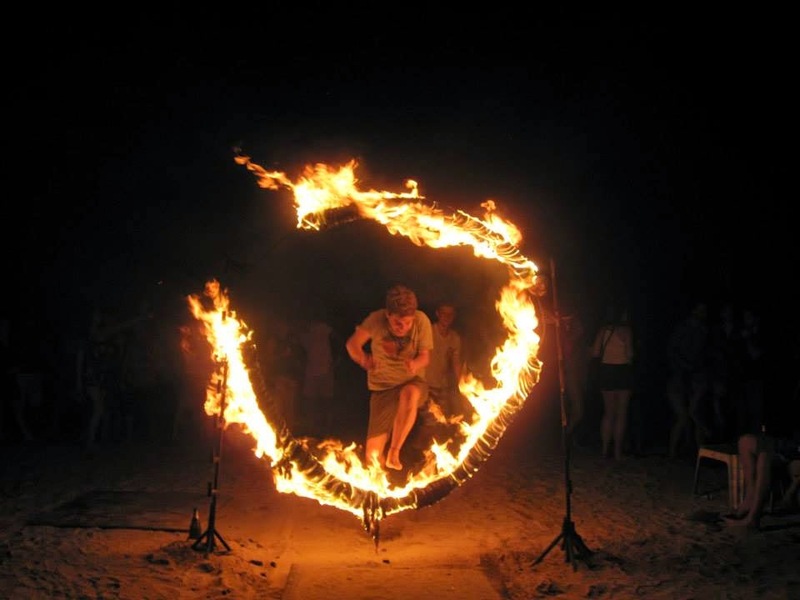 At the end of the show the audience were invited to take part in various daring challenges, including skipping over a burning rope, doing the fiery limbo and jumping through a burning ring of fire. I was so impressed when Sam and Emily shot up to jump the burning rope and it was awesome doing the fiery limbo and jumping through the burning ring! We went out the following night also and made more of a proper night of out, and drank and danced in a few of the bars and clubs on this main strip. This was lots of fun, although there were lots of testosterone-pumped, rude European lads who kept hitting on the girls and generally being annoying. The whole island is full of them, but I guess that can only be expected of a party island. 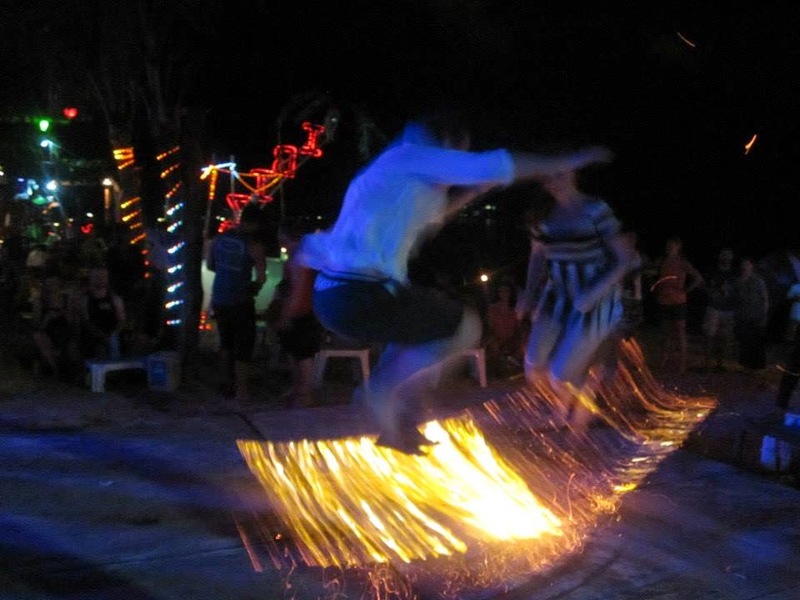 We signed up for a watersports day out, which included cliff jumping, visiting the 'monkey beach', wakeboarding, paddle boarding, snorkelling, visiting Maya Bay [where The Beach was filmed], with breakfast and lunch also included, along with soft and alcoholic drinks throughout the day. We found it hilarious when we got on the boat to discover that one of the main annoying letcherous guys from a couple of nights before was on the trip too! There were several lads on the trip who seemed disinterested in most of the watersports and focused on drinking the free beers all day instead. The guide was shocked to discover they had drunk through all of them - most of us had only had one or two and were looking forward to some on the journey back to the harbour! We didn't enjoy the trip to the monkey beach, as people were feeding them all sorts of crap. They are monkeys living in their natural habitat, who have grown used to boat loads of tourists turning up each day and feeding them. People seemed surprised when a monkey lashed out at them or even tried to bite them, when the people were trying to get really close for a monkey selfie, or teasing them with food. It was frustrating to see, so we just paddled in the sea and watched from a distance. Emily and Sam didn't fancy the cliff jumping, so Janie, myself, our guide and a couple of other people climbed the rocks ready to jump off into the sea, with Emily and Sam in the boat on camera duty! 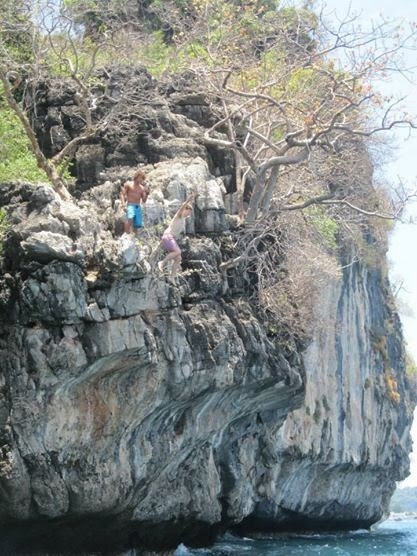 It was terrifying standing at the top and when I finally jumped off, I forgot all about the training the guide had given us and flailed hopelessly into the water, making a horrible splatting sound! Everyone grimaced, but thankfully I wasn't hurt, probably because I was pumped with so much adrenaline at the time! We really enjoyed the paddle boarding and at one point managed to get all four of us on one board! Snorkelling was amazing in the deep sea, as we could see so much below us. To be honest, it was quite daunting at first. Within a couple of minutes of being in the water, I saw two divers swim a few metres beneath me, which looks so strange. Sam had a lucky escape as he saw a jellyfish swim straight past him! Towards the end of the day, we could choose between tubing, wakeboarding or water skiing. Emily and I went for wakeboarding, as we had tried it a couple of times before. I had only wakeboarded on a cable lake, so was keen to try it on the back of a boat. I was delighted when I stood up on my third attempt, being the only one to stand up properly all day [albeit for about seven seconds]. 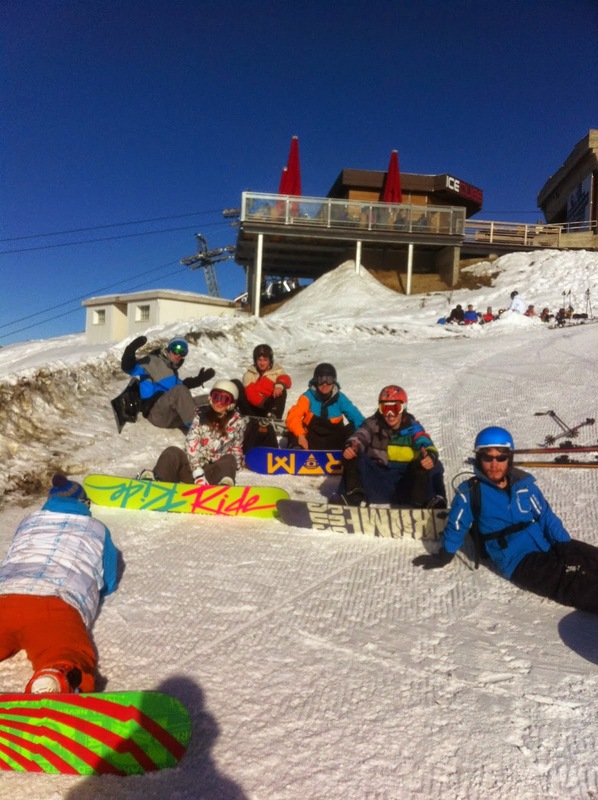 All of the annoying lads on the trip didn't manage to stand up, which made me even happier! Koh Phi Phi was a fun place to spend a few days, but it was a bit manic, so we were glad to be moving on. Our next stop was Koh Samui, which is on the other coast of Thailand, via several buses and boats. 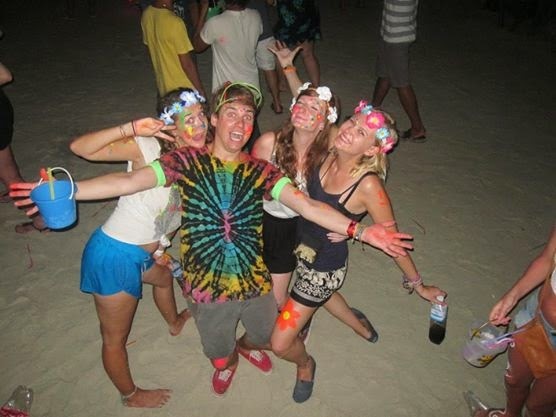 My next blog post is about the Full Moon Party on Koh Phangan, followed by post about Koh Sami, Koh Phangan and Koh Tao. 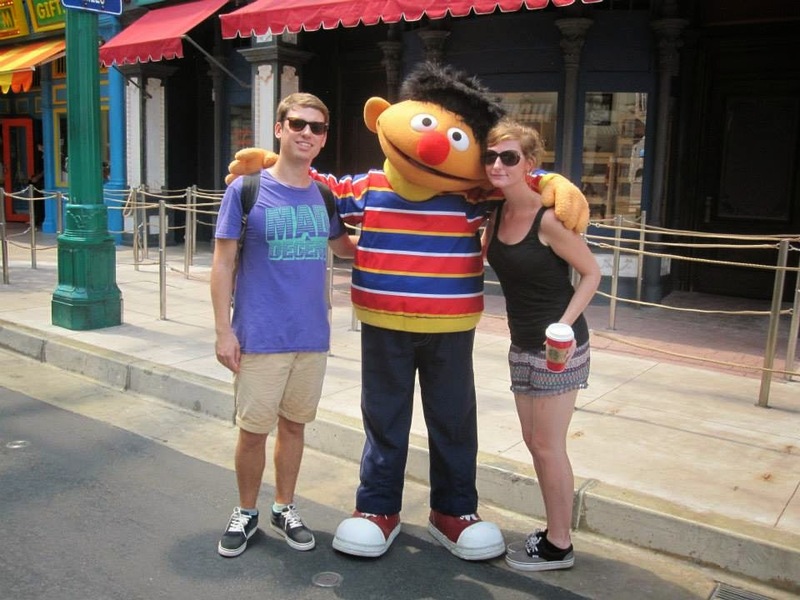 This is my sixth post of nine, about my eight week trip to Thailand with my girlfriend Emily. 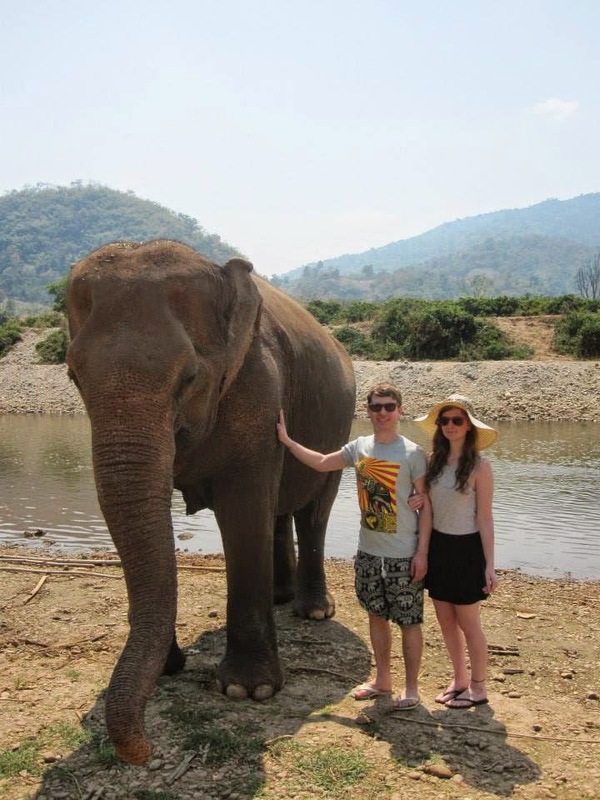 You can read about our time in Bangkok here, Chiang Mai here, the Elephant Nature Park near Chiang Mai here, Chiang Rai here and Pai here. 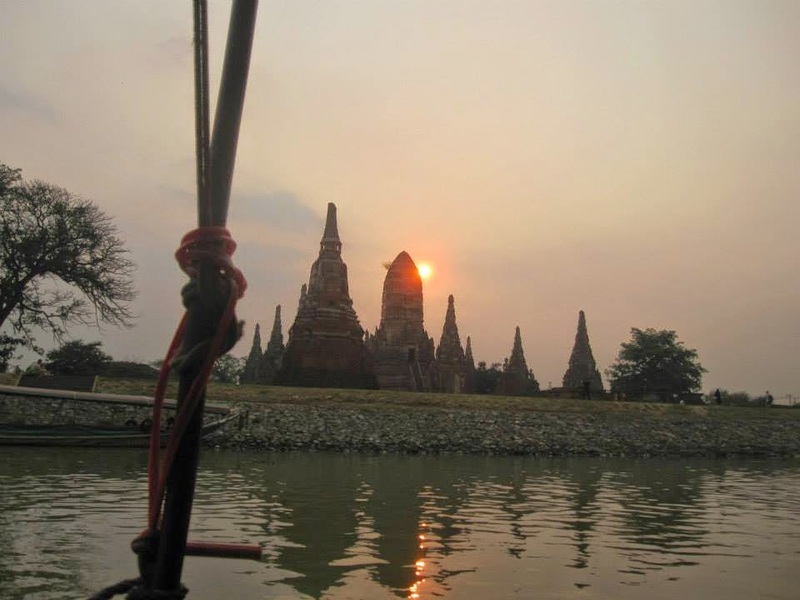 Sukhothai, meaning 'dawn of happiness' was the first capital of Siam and was established around 800 years ago. As Ayutthaya became home to the rich and powerful people in the country, Sukhothai was left to ruin and is now home to hundreds of beautiful and interesting ruins. 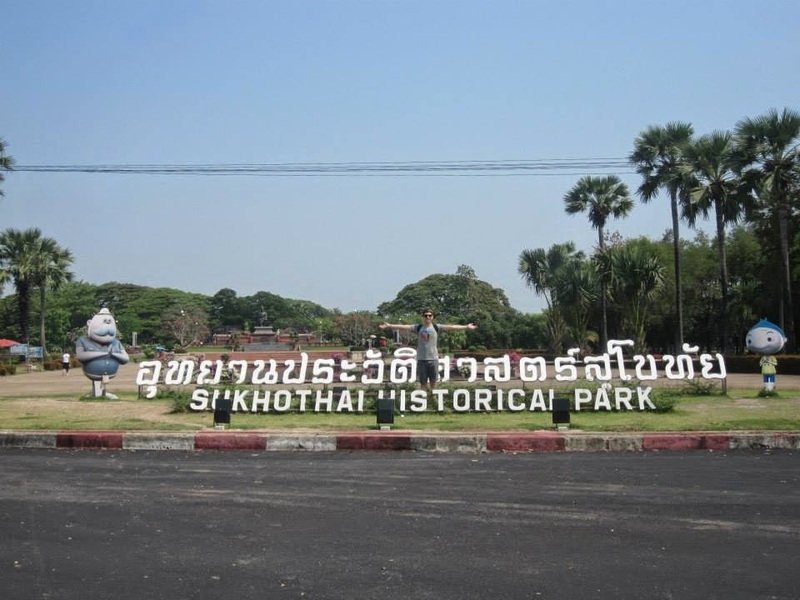 The Sukhothai Historical Park is a UNESCO World Heritage Site. We travelled on a bus for around five-hours from Chiang Mai to Sukhothai. We then took a short ride in a shared taxi from the bus station to the main guest house area in the new city, where everyone else on our taxi was headed. We stayed at Ban Thai guest house, which is one of the main places the Lonely Planet travel guide recommends. As it turns out, there are very limited guest houses available and not a whole lot of things going on in the new city in general, especially not for tourists. The old city is around a 30-minute drive away, with regular buses travelling to and from the new city. 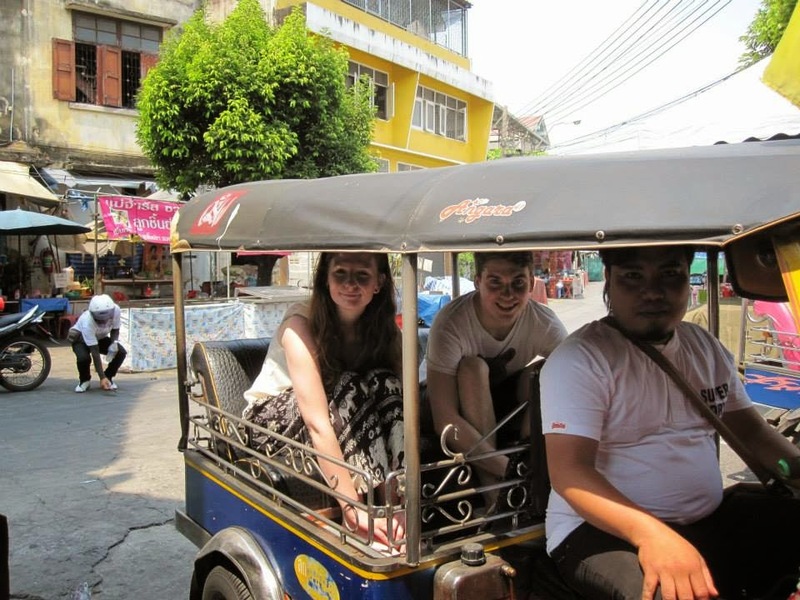 We got a tuk-tuk on the way there, as we had just missed a bus and it only cost a little bit more than the bus. The old city is split into different zones, including the main central zone, north and west zones. Each zone has a separate entrance fee, but this is a fairly small cost. The central zone contains 21 ruined temples, surrounded by a large square moat. We decided we'd explore this one zone thoroughly, rather than travelling much further around the other zones. 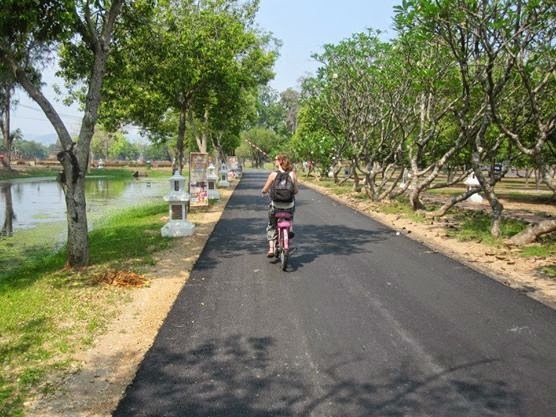 We hired bicycles for a small fee, which I'd highly recommend, as there is a lot of ground to cover! It was really lovely cycling around the park and we saw a lot more than we would have done had we been walking in the blazing heat. I'd definitely recommend taking a huge amount of bottled water with you to explore the old city. The central zone is huge and we felt like we had the place to ourselves most of the time. We saw other tourists every so often, but for the most part, we enjoyed walking around quietly, taking in the incredible ruined architecture and stopping for lots of photos! One negative point to mention is that there are little food options once you are in the park and not a lot nearby. There is one small cafe in the central zone, but it only served drinks and cheese toasties. Not particularly filling or appetising after a long time spent cycling in the heat! After a great day of exploring the old city, we headed back to our guest house. There seemed to be very limited options for entertainment in the area and we decided to head to the night bazaar. This turned out to be around twenty small food stalls and certainly not tourist friendly. We went to a little restaurant recommended by the Lonely Planet guide book, called Dream Cafe. We had a tasty dinner here, but we were the only people in there, which was a little odd. 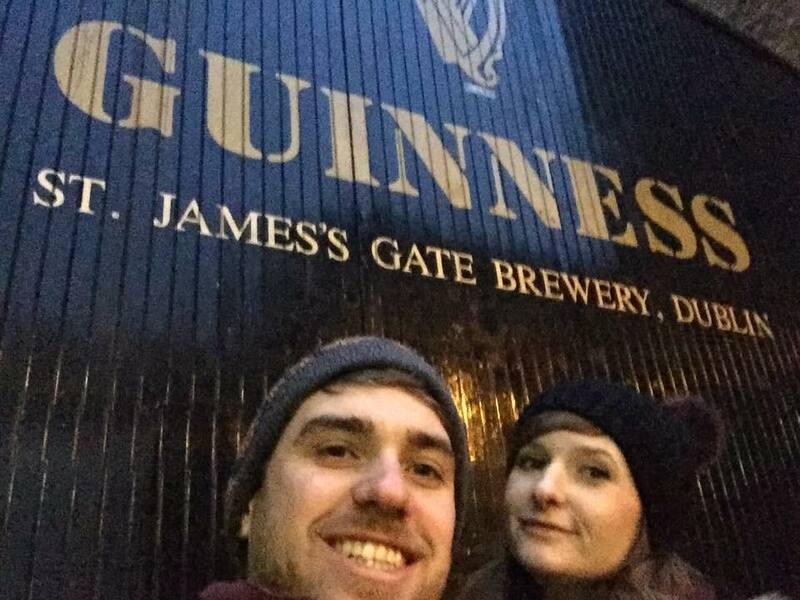 We absolutely loved exploring the old city, but there is little else to do in the area and you only need to spend one day there. The next day we headed to Ayutthaya, on another bus that took over five hours. Ayutthaya was once a thriving royal city, which was overturned by the Burmese army many centuries ago and left to ruin. It is now a UNESCO World Heritage Site. After travelling on this long bus from Sukhothai to Ayutthaya, we were annoyingly dropped at the side of a dual carriageway, which is actually the official bus stop. There was one taxi waiting, for which we got charged loads as we had no bartering power. We were dropped in the main guest house area of the city, which immediately seemed much more lively than Sukhothai, with lots of bars and restaurants. We checked in at P.U Inn and got sold tickets for a river boat trip by the owner, which was due to depart just an hour later. We were squashed into the back of a pick up truck and taken to the river, where we got on a long tail boat with other people staying at our guest house. 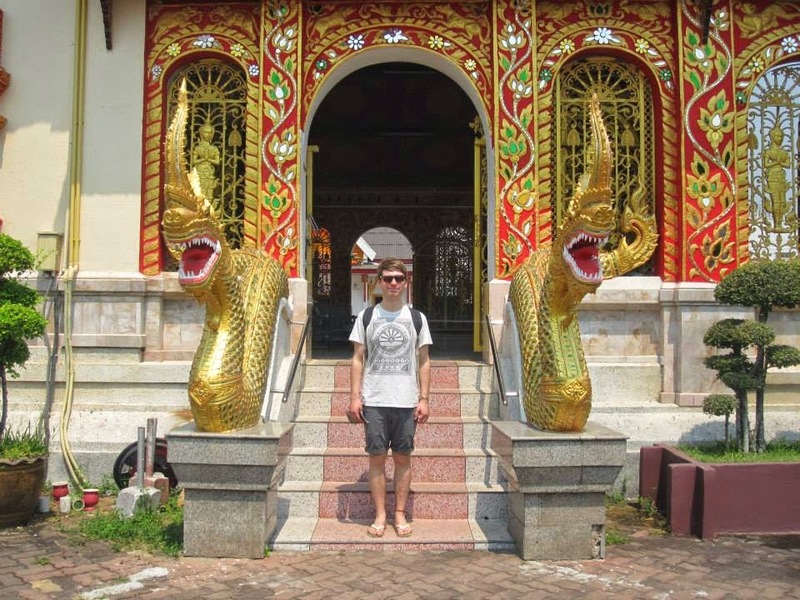 We stopped at several places along the way, where we got off to explore temples and ruins. Some of these were lovely, but some of them weren't particularly interesting and charged an extra fee for entering, which we had no choice but to pay, unless we wanted to sit and wait on the long tail boat. Whilst we were exploring the last temple as the sun was setting, which you can see above, we could hear a thunder storm in the distance. The long tail boat driver hurried us back onto the boat, to make the journey back to where we started. As the rain started hurtling down, our little boat was getting rocked around, with the water getting very choppy. As the light was disappearing, we could see fork lightning getting closer and closer to us, until it was landing just a few metres ahead of us. The journey can't have been that long, but it felt like ages! Even though the boat had a small canopy over it, we got absolutely soaked and were pleased to finally make it back to land, where we were told there would be a food market. When we got there, a lot of the stalls had packed up due to the heavy rain, which was disappointing. The boat trip was a strange experience and funny looking back at it, but quite scary at the time! The next day, after a nice evening of food and drying off after the boat trip, we went to explore the many ruins in Ayutthaya. We lost our bearings, looking at the rubbish map our guest house owner gave us, so got a tuk-tuk to take us what turned out to be a very short distance to the main site we wanted to go to, Wat Mahathat. 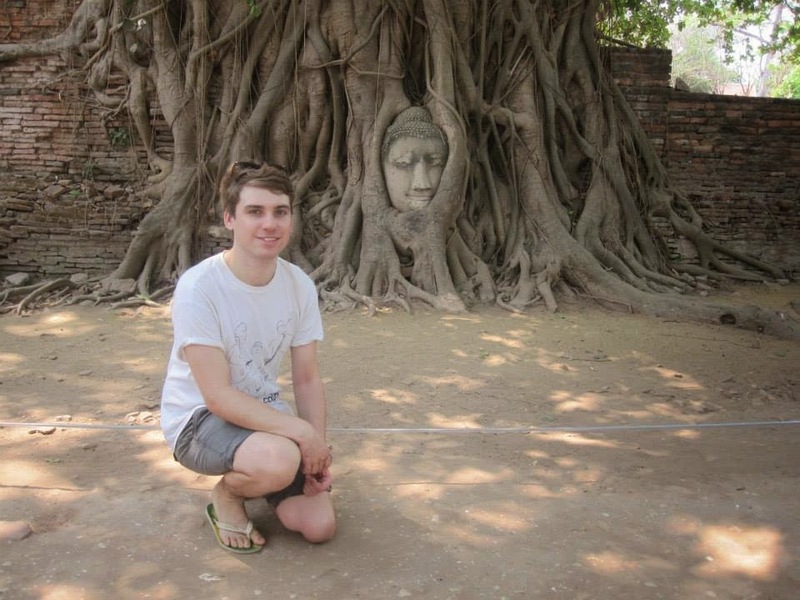 This is home to many beautiful ruins, but the main attraction is the Buddha head in the tree, which is said to be one of the most photographed things in the whole of Thailand! 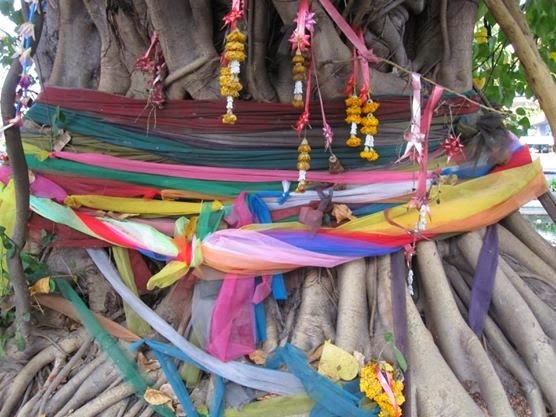 No one knows how the Buddha head in the tree came to be there, but some say that thieves tried to steal it whilst the temple was being ransacked, but dropped it because it was too heavy. The tree has grown naturally around it. Perhaps the picture doesn't do it justice, but it really was a magnificent thing to see in person. 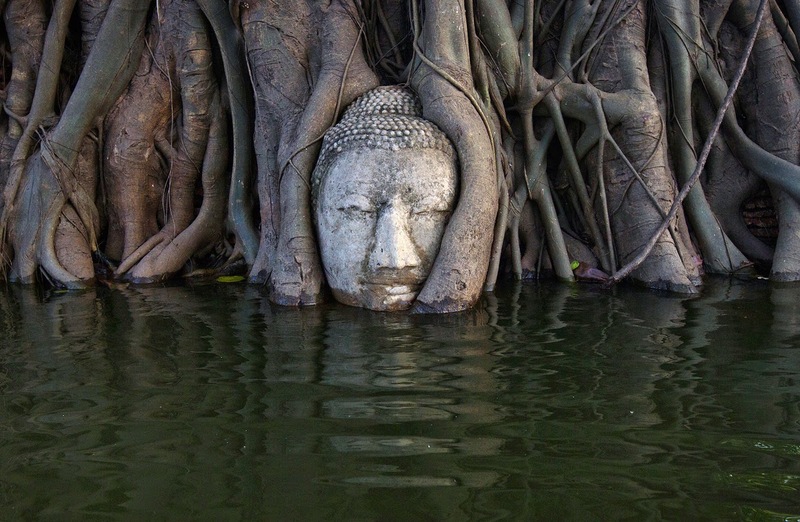 During monsoon season, waters often rise so high that started to cover the Buddha's head, as you can see in the photo below. 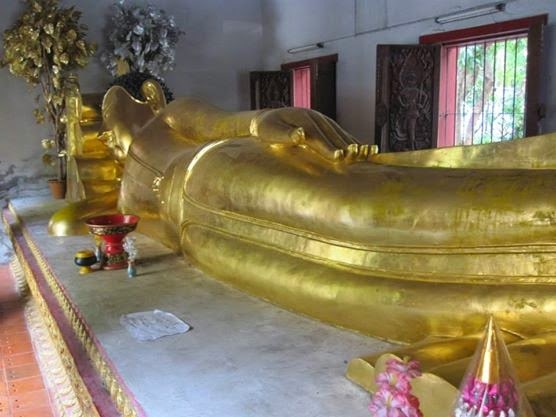 Wat Mahathat is also home to many headless Buddha statues, which were damaged during the Burmese invasion, many centuries ago. After walking around lots of other ruins, we took shelter from the heat in the Million Toy Museum. This quirky museum was set up by a children's literature lecturer from a local University, who wanted to display the toy collection he has lovingly built up over many years. 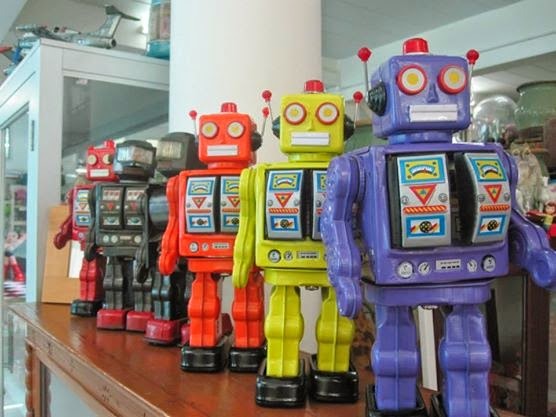 He aims to one day actually have one million toys on display. The museum itself is a modern building with lots of big windows, providing lots of natural light. There are so many interesting and awesome toys on display from over many decades, including some life sized models of Superman and other film characters. There was a small entrance fee and the museum was a great way to spend an hour sheltering from the sun. We spent the rest of our day in the swimming pool at P.U Inn, which was recently built and was very lovely. We ate here also and the food was tasty and reasonably priced. We had a funny encounter with the owner, where she was sat on the computer next to us in her lobby and she asked us to help translate some Trip Advisor reviews for her. Emily was helping her translate some, which turned out to be reviews saying how awful the guest house and the owner in particular were! We found the guest house to be pretty average, the owner a little strange, but not offensive and the swimming pool to be great. 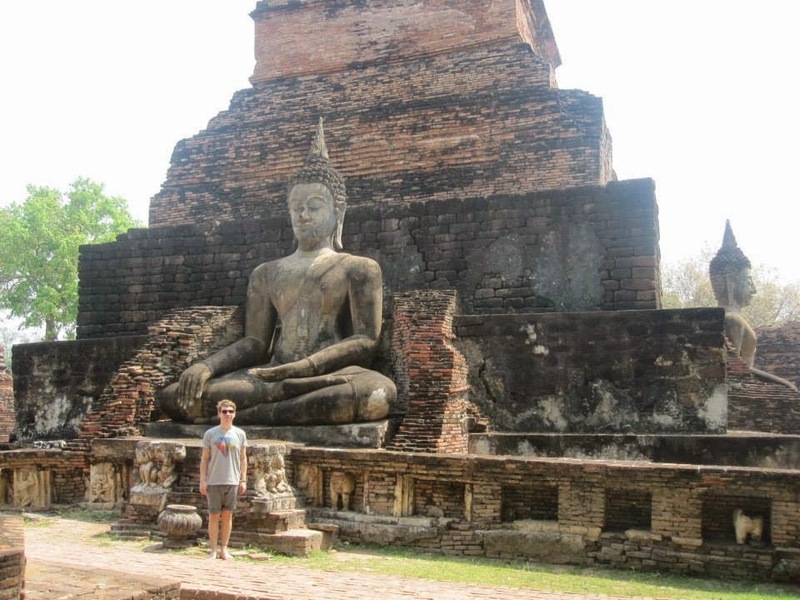 Overall Ayutthaya was a lovely place to visit and full of lots of incredible history. The next day we took a one-hour minivan to Bangkok, ready to catch a 17-hour bus down to Krabi, a beach resort in the South. 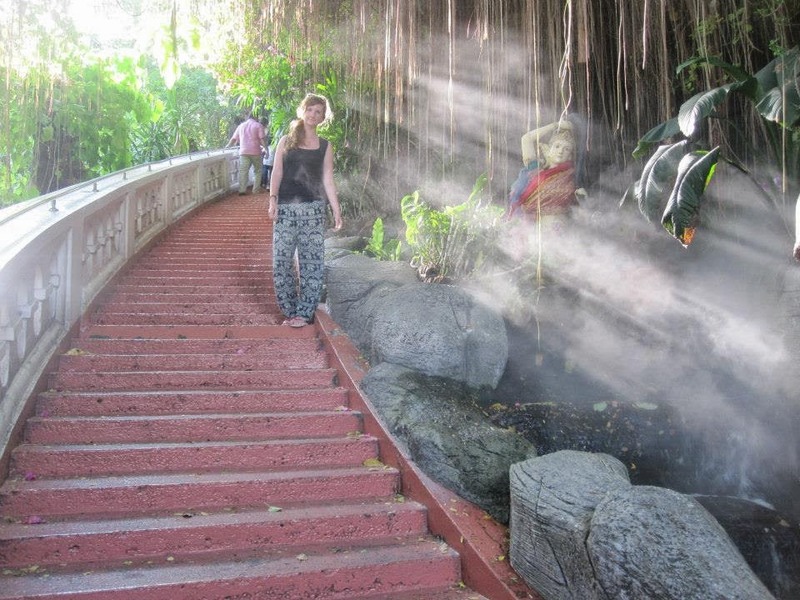 This is fifth in a series of nine posts about my eight week visit to Thailand with my girlfriend Emily. You can read my posts about Bangkok here, Chiang Mai here, the Elephant Nature Park near Chiang Mai here and Chiang Rai here. Pai is located in the far north or Thailand, on a very long and windy route from Chiang Mai. Pai is very popular with Thai people, as well as tourists, with the small town overflowing with people during peak tourist season and many people resorting to sleeping in tents, which must be roasting! Pai was devastated by a landslide a few years ago, but you see little evidence of this now, as the town has bounced back and seems to be thriving. The route from Chiang Mai to Pai has 762 famous curves. The route really is very bendy and makes a lot of people feel travel sick, even people who don't usually suffer from this! Some friends we met in Chiang Mai recommended we stay at Pai Country Huts. There are lots of other great hut accommodation options in Pai, but ours was well located, quiet and all round a very lovely place to stay. 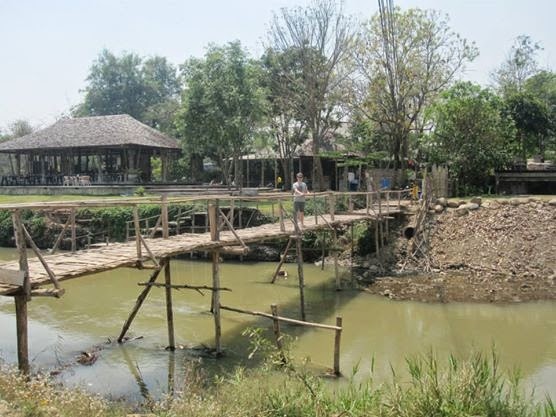 There is a road option further away to get to Pai Country Huts, but the main pedestrian route, a short 5-10 minute walk from the main town is over a bamboo bridge. It's actually quite scary the first time you use it, but I ended up loving using it! There are many guest house and hotel options in Pai too, if you don't fancy snoozing in huts. We stayed in Pai and at Pai Country Huts for six nights in total. The first two nights we stayed in the hut below, then moved to a slightly bigger hut for the next four nights, at a slightly higher price. 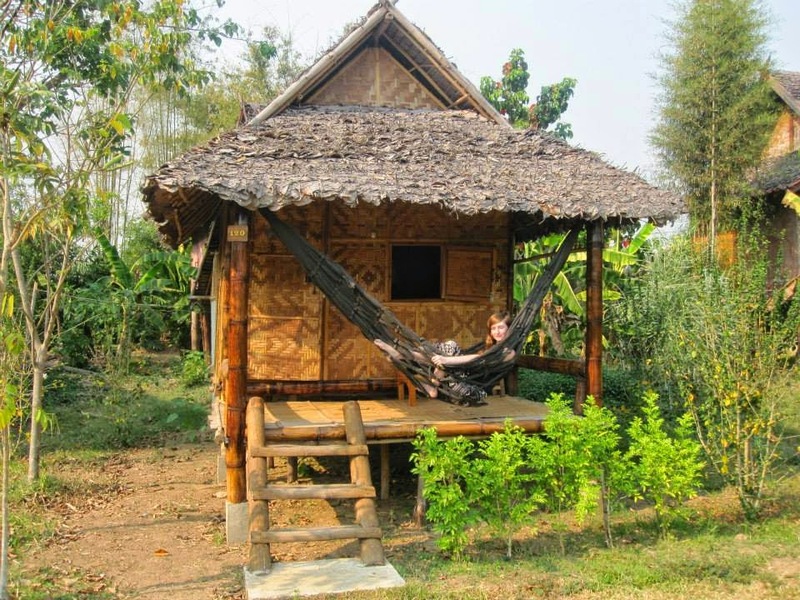 All huts have a lovely hammock out the front, which was great for chilling out during the day. The huts have a built in bathroom and comfy double bed, with a mosquito net around it, not that we felt we needed it during our stay. 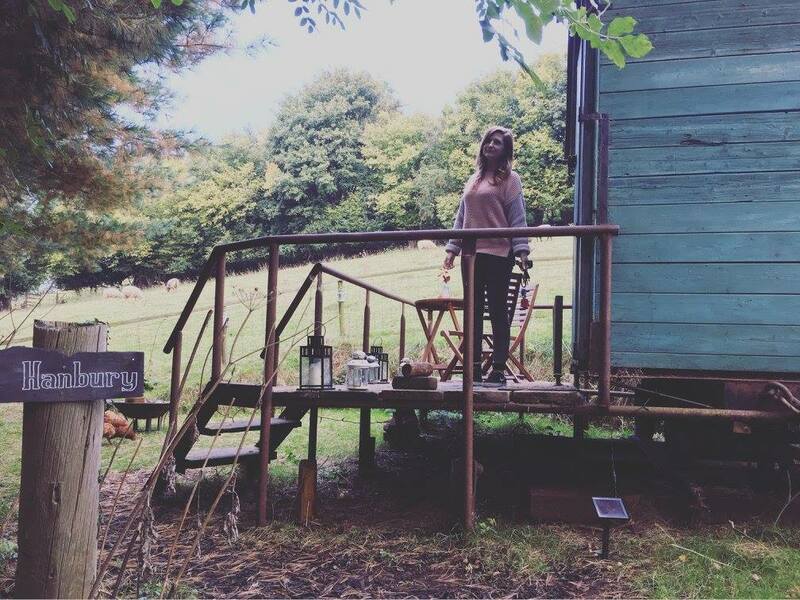 We were definitely at one with nature during our stay in our hut. We heard lots of unusual animal sounds throughout the night, which was a little strange on our first night, but we quickly got used to it. 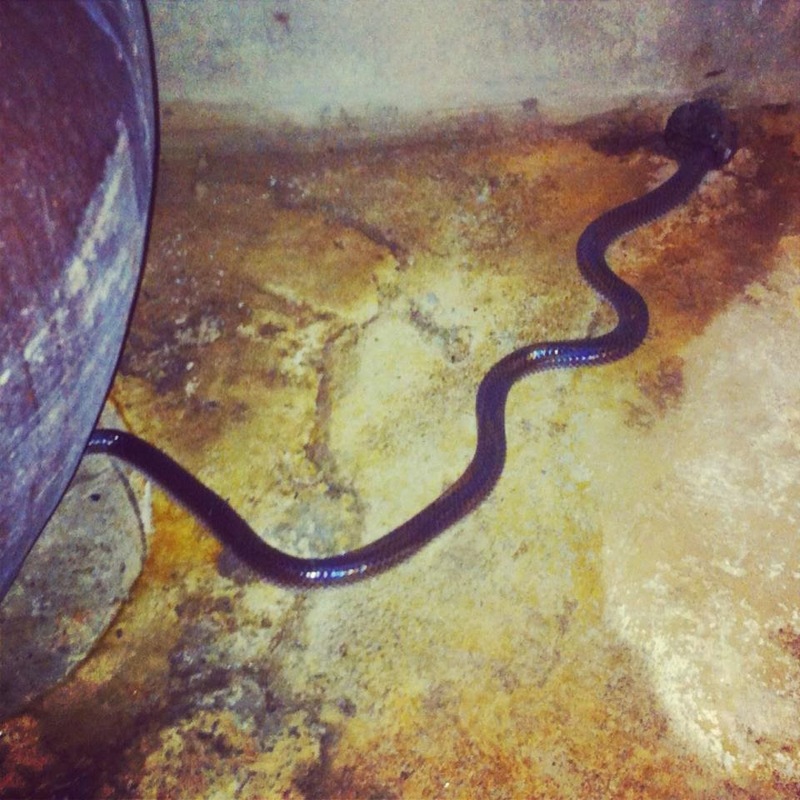 Although we loved staying in a hut, on our first night we had a close encounter with a huge snake in our bathroom! The manager came and removed it for us and insisted it hadn't happened before. The grill was missing from the small drainage hole for the shower in the bathroom and it had wriggled in. 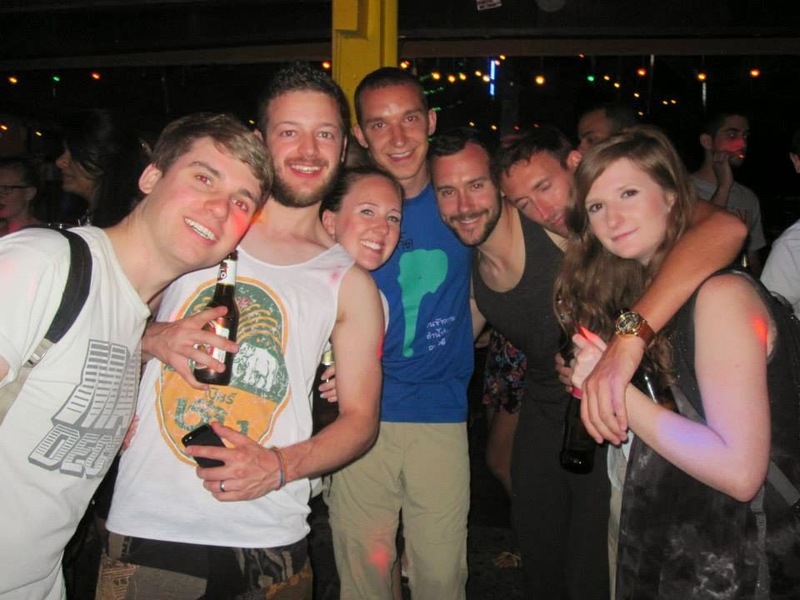 During our time in Pai, we met Sam and Janie in a bar, while we were having drinks with a girl called Leah from Germany, who we met in our guest house in Chiang Mai. Sam and Janie are lovely and we met up with them many more times throughout the rest of our time in Thailand, so you'll be hearing lots more about them in future posts. We also met Max and Laurids from Germany through Leah, who we also met up with several times whilst in Pai and had a lot of fun with. One night we taught them English card games and they taught us German card games with a Bavarian pack of cards. 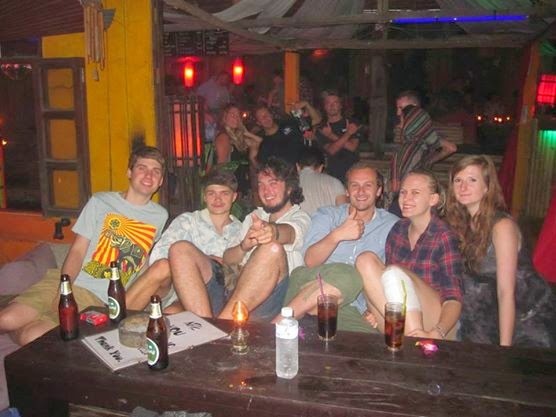 Pai has lots of interesting bars, some of which are only partly covered and have big fire pits in the middle! There is a strong hippie theme in Pai with lots of the bars playing Reggae music. There are also loads of great places to eat in Pai, our favourite being the Witching Well, which was spookily themed inside. Sam [Gosport, UK], Janie [Essex, UK] and Emily. 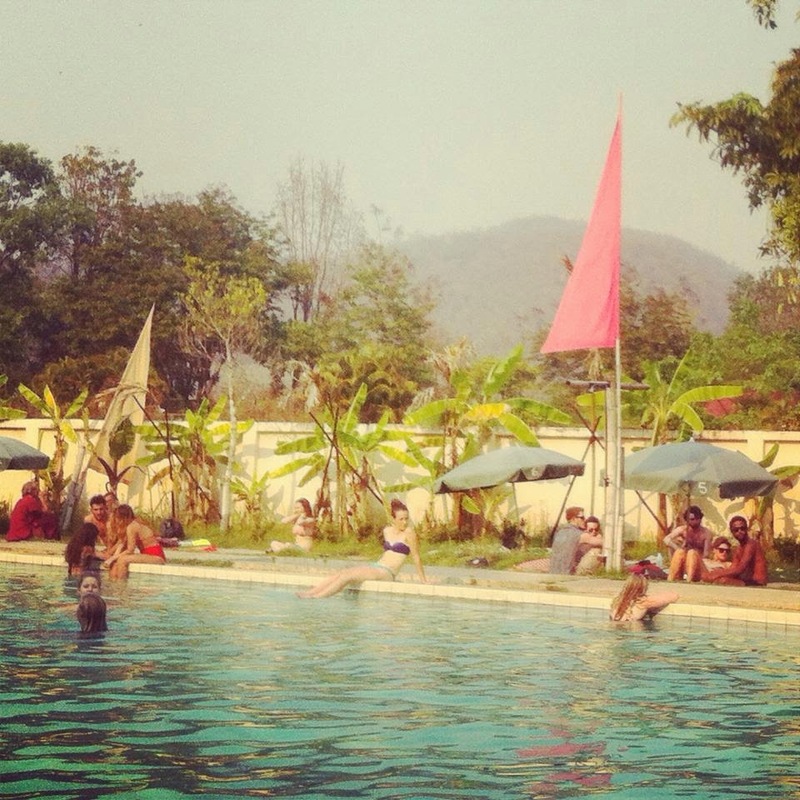 We spent two days lounging in the sunshine next to Pai's popular outdoor swimming pool, called Fluid, on the outskirts of the town. Entry to the pool is cheap, it's clean and they serve tasty food too. Mountains overlook the swimming pool, and Pai in general, which is a pretty backdrop to lovely days spent lounging around by the pool or in our hut hammock. Emily and I went on a day trip with Sam and Janie, paying a very small and reasonable amount to do a five-hour tour of the local area. We were told they normally do this in bigger vehicles, but as there were only four of us, we were driven round in a normal car by a Thai chap. He spoke little English, but was friendly and told us to take as much time as we wanted to look at the various things we stopped to look at. The day started with a visit to 'the big Buddha on the hill', which was very impressive, although they were in the process of building stairs leading up to it, so it was a bit tricky climbing up the steep hill to get to it! The big Buddha is next to a viewpoint that overlooks Pai, but due to a lot of smoke in the air caused by farmers burning off rice fields, we couldn't see far. We then visited the World War II Memorial Bridge, which is a memorial to the contribution the area made to the war, in providing a route for soldiers into Burma. We also visited a strawberry farm and tasted some delicious fresher strawberries, along with a visit to a coffee shop called Coffee in Love. This is bizarrely very popular with Japanese tourists, due to the huge sign outside stating the shops name! The day continued with visits to two pretty temples and a visit to the Hot Springs. I was the only one of the four of us to take a dip in the Hot Springs and really enjoyed it! 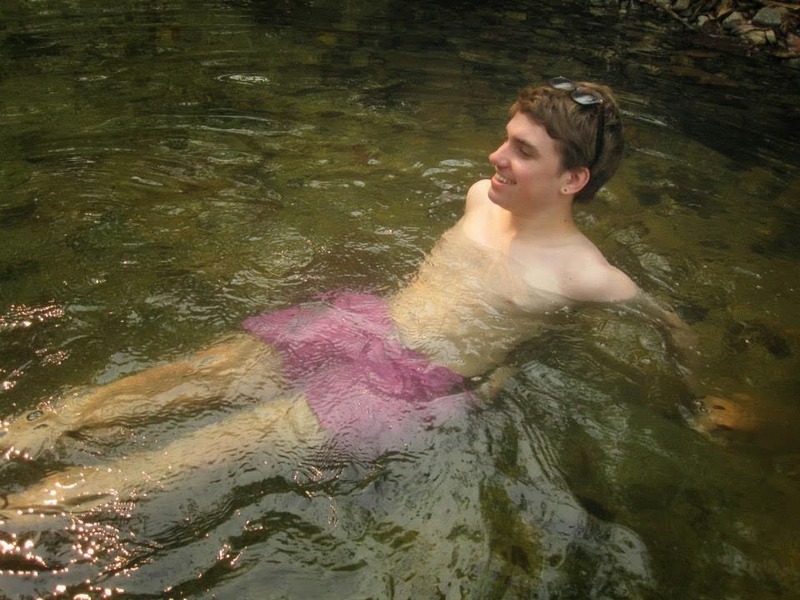 It was lovely and refreshing, and despite the air already being very warm in general, the warm water was very enjoyable. We stopped in the Chinese Village for lunch and had some tasty food, which was a nice change from all the Thai cuisine we had been having for the last couple of weeks. Towards the end of the day we visited a local waterfall, but it wasn't particularly impressive as it was quite dried up, as monsoon season doesn't start until May. Saying that, we visited another waterfall in Koh Samui later in our trip, which was gushing with water and was very impressive. More on that in a couple of weeks! Although we absolutely loved Pai, we were unfortunate enough to be there during three days of power cuts. The electricity outage was intermittent, with the electrictity only coming back on late on night one and the power out most of the days on day two and three. The electricity also stopped running water, as this all works with pump systems in Pai. We were told there had been an accident with a falling tree to cause these outages, but it did seem like it was a fairly common occurrence in Pai. 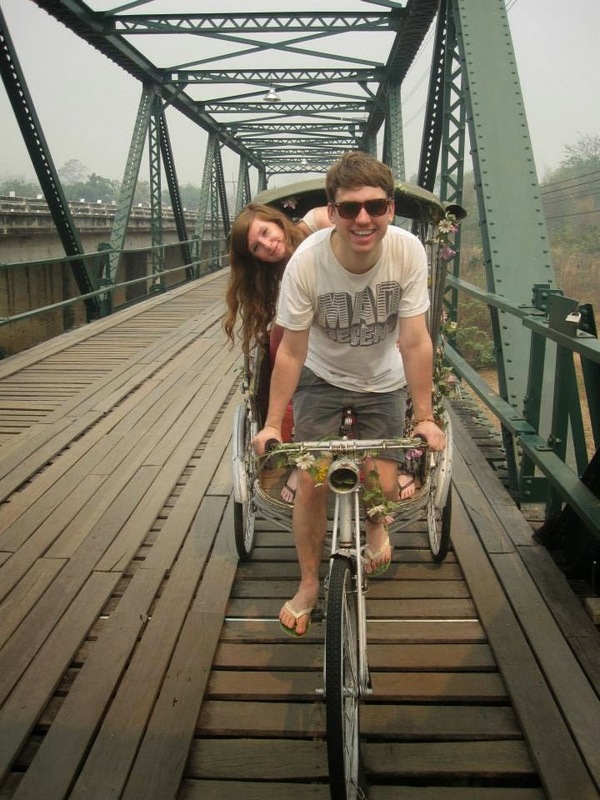 Continuing with my month of posts about the eight weeks I spent in Thailand recently with my girlfriend Emily, this post is all about Chiang Rai. You can read my posts about Bangkok here, Chiang Mai here and the Elephant Nature Park near Chiang Mai here. Chiang Rai was by far my least favourite of the twelve main locations we visited in Thailand. I would go as far as to say that I wouldn't recommend you go into the city itself to visit and stay the night. There are a few tourist attractions in the area worth visiting, but there are plenty of long day trips from Chiang Mai you can do, which tour all the main attractions and avoid visiting the uninteresting centre of Chiang Rai itself. We stayed in Chiang Rai for one full day, before travelling back to Chiang Mai the following day and would have left quicker if we could. We got a minivan from Chiang Mai to Chiang Rai, which took around four hours. 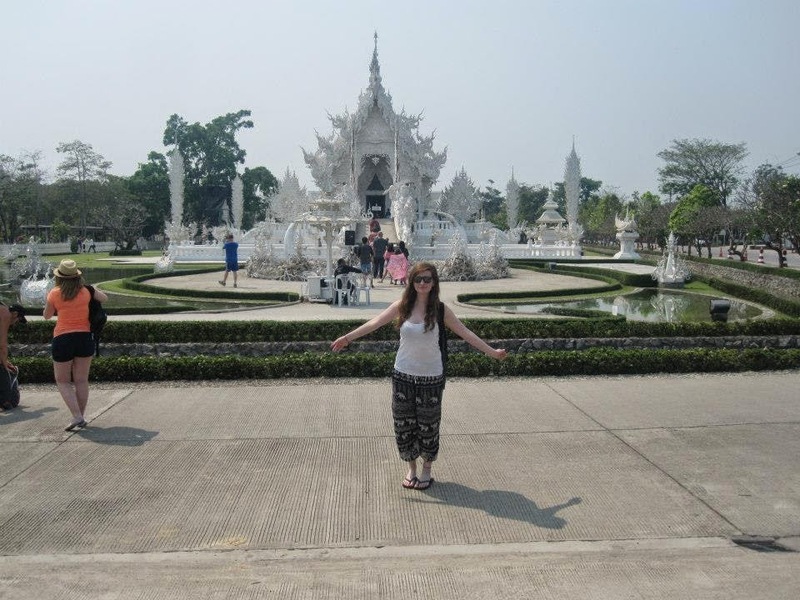 The minivan journey included a convenient extended tourist stop and toilet break at the White Temple, about 14km outside the centre of Chiang Rai. 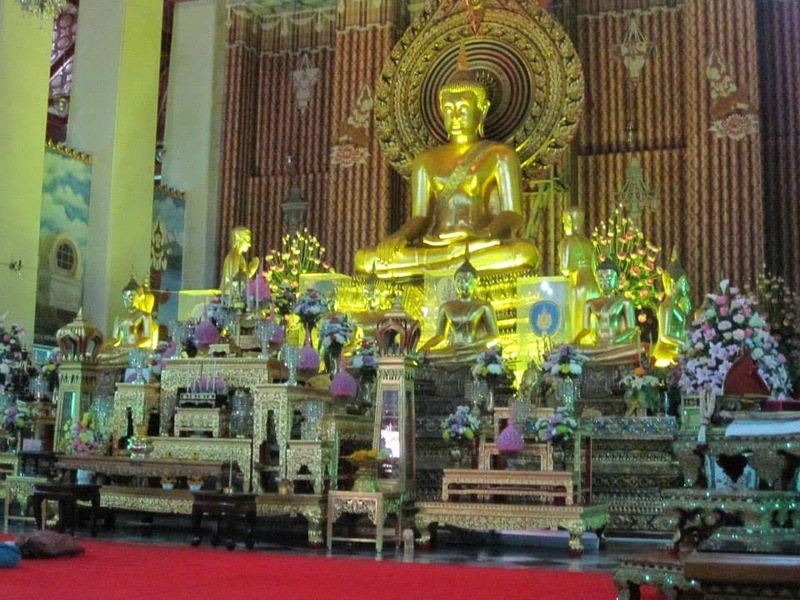 It's very different to any other temple we saw in Thailand, as it was only built in 1997. 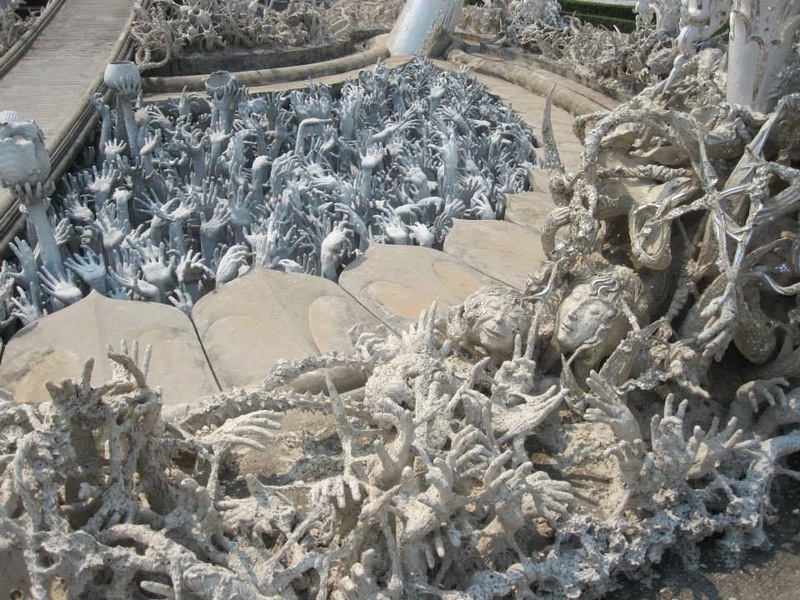 The entrance to the White Temple has lots of stone hands coming out the ground, to depict the entrance to hell. We saw some people trying to walk back down the main bridge entrance to the temple and a man on a tannoy said "you cannot come out this way, you cannot walk back down into hell!". A very strange experience indeed. 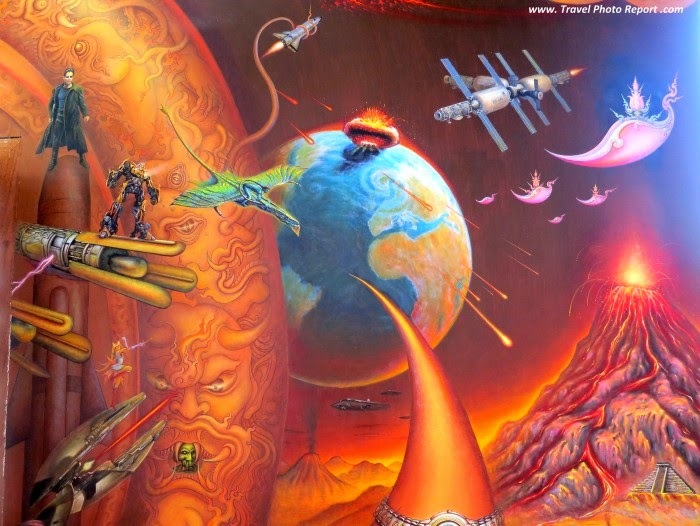 The interior architecture and imagery is quite strange and it seemed more like a tourist attraction than the place of worship it is meant to be. Inside there are very modern images painted on the walls, including Keanu Reeves in the Matrix and Superman, to name a couple! Outside the White Temple there are casted heads of famous movie characters hanging from the trees, including Batman and Hellboy. The temple does have some 'normal' and pretty architecture too, but there was just a very strange feeling at the temple, like we were in a theme park. We just weren't quite sure what to make of it all! We found a guest house in Chiang Rai, located on the end of Jet Yod Road. This seemed to be the main tourist and backpacker area of the city, according to the Lonely Planet guide book. All of the restaurants and bars charged quite a lot more than we were used to in Chiang Mai and we soon discovered that this was because there wasn't much in the way of tourist friendly options in the city. We didn't want everything to be too touristy, but we still need some familiarity to be able to order food and know what we are ordering. We ended up eating in one little cafe three times, as it's the only place we found that seemed well priced and welcoming, after much venturing. All of the day trips on offer are the same ones on offer in Chiang Mai, but just a lot closer. The main tourist attractions in the area are a visit to the hill tribes, a visit to the Black Temple and to see the Golden Triangle area, which has a lot of history with the opium trade. 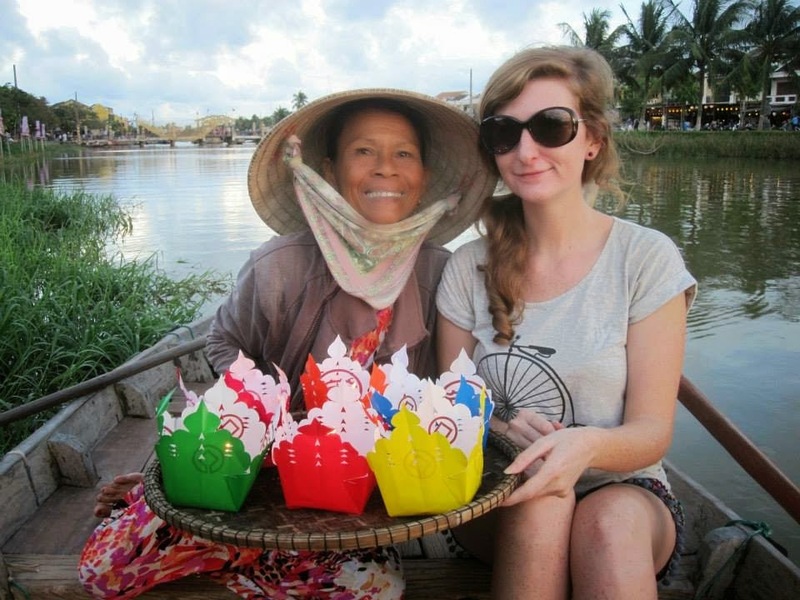 These trips often include a 'visa run' to Laos, which is a bit of a pain if you don't need to do this. We didn't do this day trip, but some people we spoke to who did said it was a very long day and not particularly exciting. We were pleased that people who had been to see the hill tribes agreed with our assumption that the hill tribes were far too much of a tourist attraction, and not the natural environment and old fashioned people they are made out to be by tour operators. During our one full day in the area, we visited some temples and saw all the main sites, including the new and old clock towers. I really don't want to be horribly negative about Chiang Rai, but we really did find it uninteresting and it just didn't have a good vibe. We headed back to Chiang Mai, where we stayed for a further two days, before heading to Pai. My next blog post will be about Pai, a lovely hippie town in the far North of Thailand. 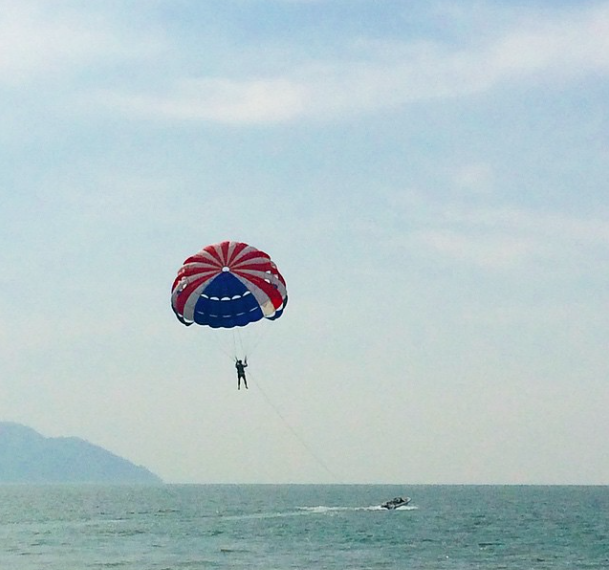 This is my third post about my recent eight week trip to Thailand with my girlfriend Emily. 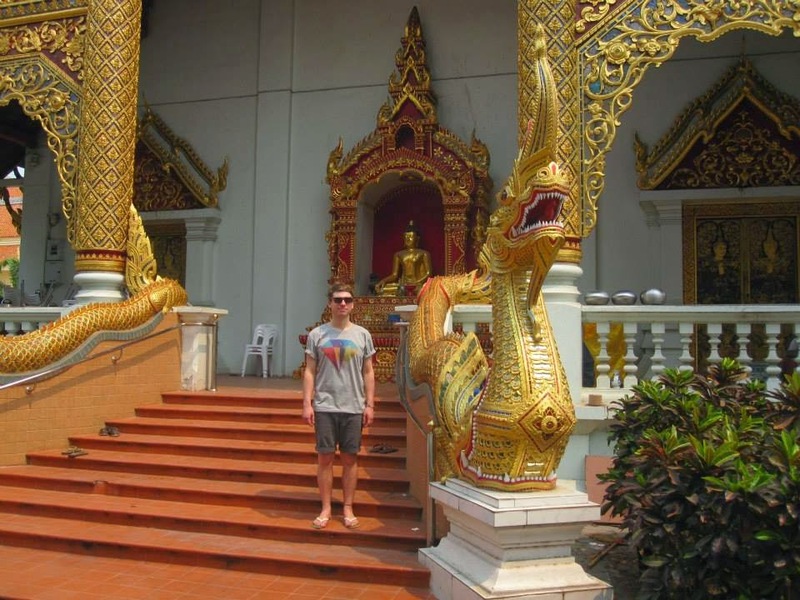 You can read about our first few days in Thailand, in Bangkok here. 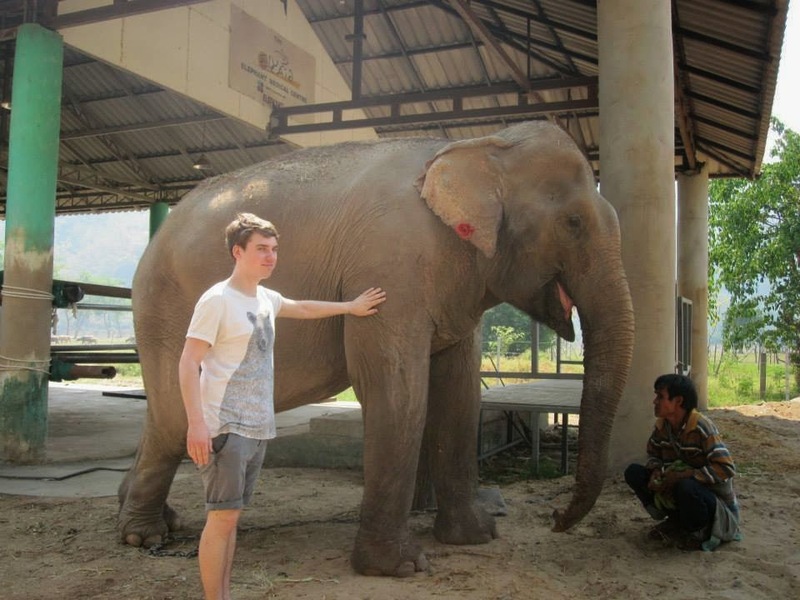 You can read about the rest of our time in Chiang Mai, other than at the Elephant Nature Park here. 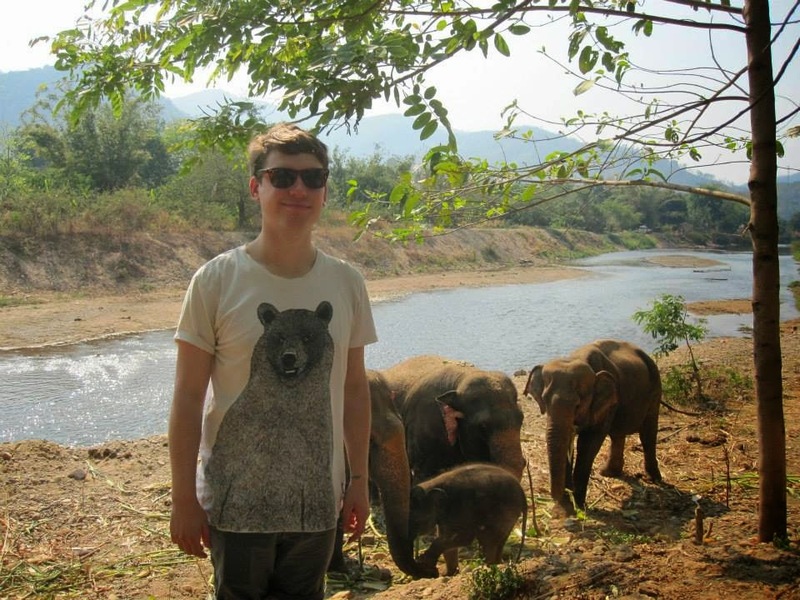 One of the main things we were excited to do in Thailand was see Elephants. They are such huge and impressive animals and I've always wanted to see one in as close to their natural environment as possible. We researched places to see Elephants and didn't want to go anywhere where they allow people to ride them, or cause them any unnecessary harm or distress. Through many recommendations and from our own research, we discovered the Elephant Nature Park, located around 60km from Chiang Mai. The Elephant Nature Park is a rural sanctuary and rescue centre for elephants that have been abused or mistreated for work or tourism. Domesticated elephants are rescued from abusive work and situations, then live as free as they can be on 300 acres of land in the park with food and care provided every day. The Elephant Nature Park offers surroundings that are as close as they can be to the wild, but as they're already domesticated and have been for many years, they need humans on hand to provide food and medical care which the park provides. There are currently 30 Elephants in the park, with a large number of staff working very hard to look after the Elephants. Each Elephant also has it's own full-time Mahout to supervise it, ensure it is well fed and does not get itself in trouble with other Elephants or with humans on site. The elephants had created their own 'families' and herds within the park, even though none of them are related. The different herds are all so protective of each other, it was really lovely to see. It did however make me a bit sad to find out that there is one Elephant who lives on it's own with no herd! There is one blind Elephant who arrived and was quickly adopted by another herd, with one Elephant in particularly having taken on the role of her guide. All of the money charged for entry goes towards maintaining and improving the park and to care for the Elephants. The day is well thought out, with plenty to do and great value for money. We were picked up in a minivan from our guest house at around 10am. We drove for around an hour to get to the park, whilst for the most-part of the journey we watched a long video about the work the park does. To be honest, we would rather have not watched this and just waited until we got to the park to see everything for ourselves! A guide was with us in the minivan and stayed with us all day, telling us about all aspects of the park and about the individual Elephants stories. 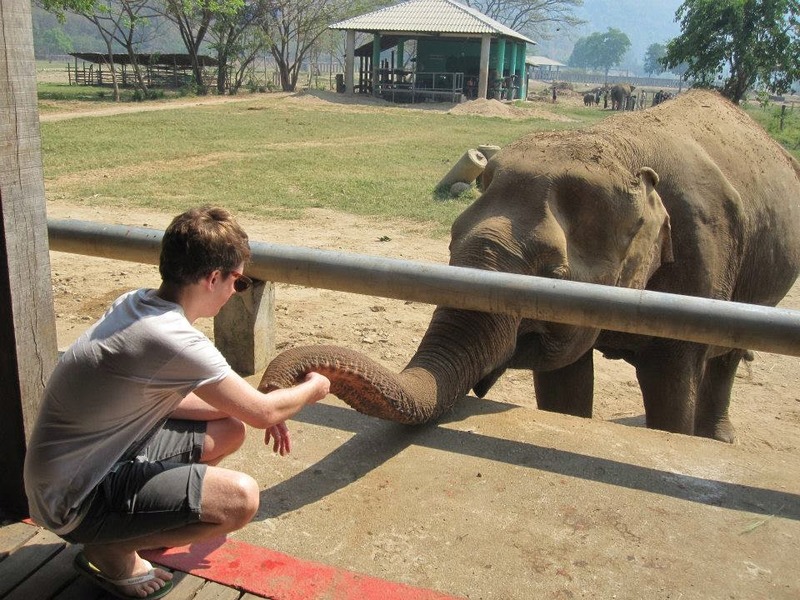 Upon arrival, it wasn't long at all until we were feeding the Elephants, which was just completely amazing. They are such incredible animals and it was so impressive seeing what they could do with their long trunks! We were then carefully lead through the Elephant enclosure to the Elephant medical centre, where we met a beautiful Elephant who had been very badly treated by a logging business. She has a big whole in her ear where her keepers had used a big hook to lead her around, which was sad to see. The Elephant Nature Park have now put a huge flower in the hole, so it looked like a big beautiful earring! Next it was human lunchtime, with an absolutely enormous buffet selection to choose from. Probably the best meal I had during my whole eight weeks in Thailand. After lunch, we were invited to watch an educational video in a conference room, but we opted to watch the magnificent Elephants from a viewing platform instead. After everyone else had finished watching the video, we were then carefully lead back into the Elephant enclosure to view lots of Elephants close-up and learn more about them. 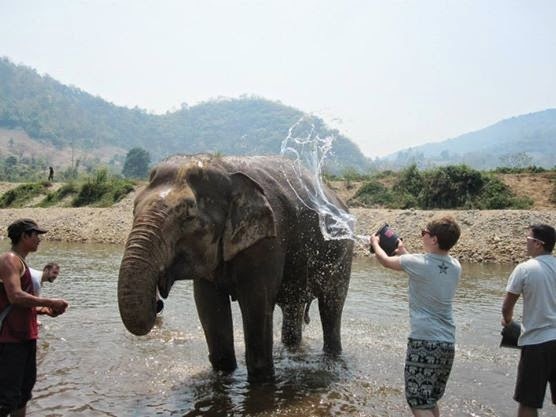 Washing an Elephant, so much fun! One of the best parts of the day was washing the Elephants in the river. As soon as they got out of the river, the Elephants immediately threw dust over themselves with their trunks, as this acts as natural sun protection. All our hard work for nothing! Finally, before home time, it was time for one last feeding, which was no-less exciting than the first time. We were driven back to Chiang Mai and dropped at our guest house at around 5.30pm. An absolutely amazing day out. Continuing with my month of posts about the eight weeks I spent in Thailand with my girlfriend, this post is about Thailand's 'second city' Chiang Mai. This city was absolutely my favourite place in the whole of Thailand, due to it's beauty, culture and friendly atmosphere. 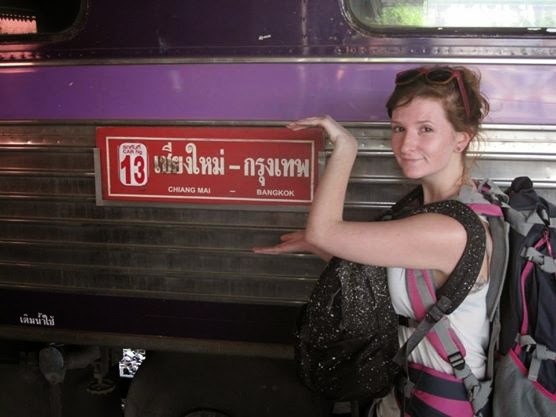 We arrived at around lunchtime, after taking a 17-hour night sleeper train from Bangkok. The train was supposed to take around 12-hours, but it made a long unexpected stop on the way. The train was very comfortable, with chairs in the carriages until around 10pm, at which time a member of staff comes round and turns the chairs into two bunk beds. We got a decent amount of sleep in and felt safe. Having gone on many long bus journeys during the rest of our trip, train travel is definitely much more comfortable and an all round much nicer experience. The most popular area of Chiang Mai is the Old City, which is surrounded by city walls, with a north, south, east and west gate. This has been restored, but is still an impressive boundary surrounding the beautiful old city. We decided to walk from the railway station to the Old City, which is around two miles, to stretch our legs after the long train journey. Even before we got to the Old City, walking through the outskirts, we immediately felt Chiang Mai was much nicer, less busy and less hectic than Bangkok. We headed to a guest house to dump our bags and then went to explore. Within an hour, someone had stopped us to have a chat. Having spent a few days in Bangkok, we were immediately worried that they would either try and turn the conversation around to trying to make us buy something in a pushy way, or that they would be distracting us to try and steal something from us. As it turned out, the person really did want to just have a nice chat with us. We stopped and chatted to a few other people while in Chiang Mai too. The people are lovely and aren't hell-bent on using pushy sales tactics to extract money from you. We already knew from researching ethical elephant camps that we wanted to go to the Elephant Nature Park, near Chiang Mai. 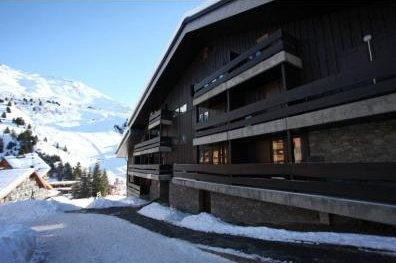 One of the first things we did was find their main office and go and book our day trip for a couple of days later. We wanted to go somewhere where they did not allow people to ride on the elephants and where they were well looked after. The Elephant Nature Park ticked all the right boxes for us. My next blog post will be all about our trip there, as I don't think a quick mention on this one would do it justice, as it was such an amazing day! On our second night, we visited the Chiang Mai Night Bazaar, which a lot of people had recommended to us. This is a short walk from the Old City and is in a district of it's own. The main Night Bazaar has it's own dedicated area, with many lovely market stalls and plenty of places to eat and drink. The road immediately outside the entrance to this also has many market stalls that pop up each night. There is a really great atmosphere in this whole area, and we didn't find the market traders at all pushy. There are loads of lovely handmade items for sale and the quality of items was just generally really nice, with so many things we wanted to buy, but so little space to carry them around with us! 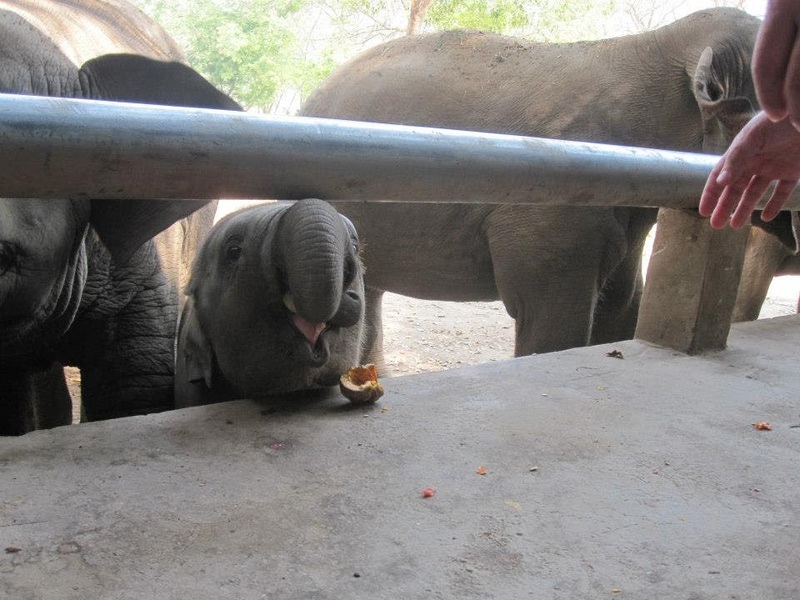 We met some lovely people at the Elephant Nature Park trip, who travelled in a minivan there and back with us. 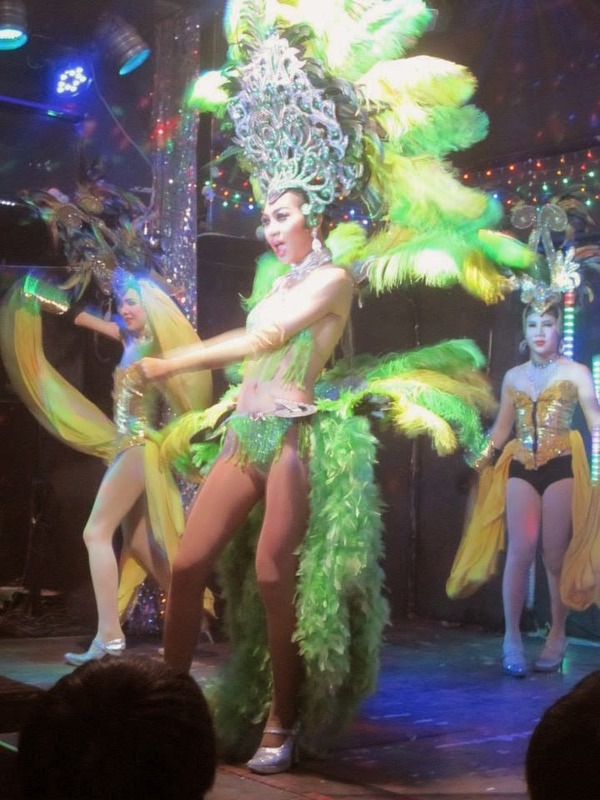 We met up with them that evening and returned to the Chiang Mai Night Bazaar, to go and see the famous Ladyboy Cabaret Show which starts every night at 9pm. This was a very fun and flamboyant show, with ladyboys miming and dancing to lots of camp songs and generally putting on a fun and exciting performance. During the show one of the ladyboys came and sat on my lap during her performance and it was rather embarrassing. I didn't mind it half as much as our new friend Mario from Switzerland, who got straddled and looked like he was going to die with embarrassment! We then went out for more drinks and dancing at a great bar called Zoe in Yellow. We saw lots of tourists riding hired mopeds, so we thought we would give it a go to drive to a waterfall, 60km away. We thought this sounded easy enough, but after a short ride around the block, we realised it was much harder than it looks! During the rest of our Thailand trip, we met and/or saw many people who had been involved in motorcycle accidents. Lots of people try it, who haven't had any lessons, and lack of experience, mixed with poor quality Thai roads, often leads to tourists getting very hurt. The Police are also known to penalise tourists for not wearing helmets, even if Thais don't bother wearing them. Personally I think it's daft not to wear a helmet, whether the Police get involved or not! We also heard about lots of people getting charged exorbitant amounts of money for damage to hire vehicles, where the damage was already there before they hired it. All in all, I would not hire a moped again and would advise anyone doing so to be all round very careful. The moped owner giving Emily a very brief lesson in how to use a moped! After a less than successful experience with mopeds, we rented bicycles for a small fee - there are loads of places to hire from. It was really lovely to have a leisurely cycle around the Old City and we cycled around small side streets which we probably wouldn't have walked around if we had taken the time to walk. 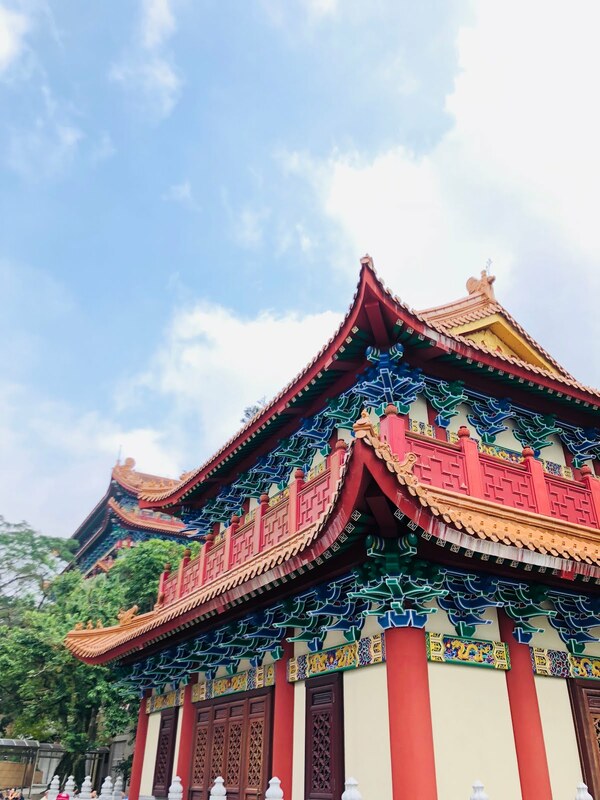 During our bicycle trip and on other days spent walking around the Old City, we visited many wats [temples], all of which have a uniqueness about them. There is a wat on practically every street in the Old City, and I've been told that there are over 200 wats in Chiang Mai in total. We found so many great places to eat in Chiang Mai, including some vegetarian only restaurants which I was really pleased about. Some of the cafes and restaurants we found in the Lonely Planet guide book. Others we just walked around seeing what we fancied and most places have menus displayed outside, so you can get an idea of price and what is on offer. Our favourite place to eat in Chiang Mai, where we ate no less than four times, is Dada Kafe. They have a brilliant range of Thai and Farang [foreigner] food and loads of particularly nice fruit shakes, including ones which supposedly have 'healing powers'. 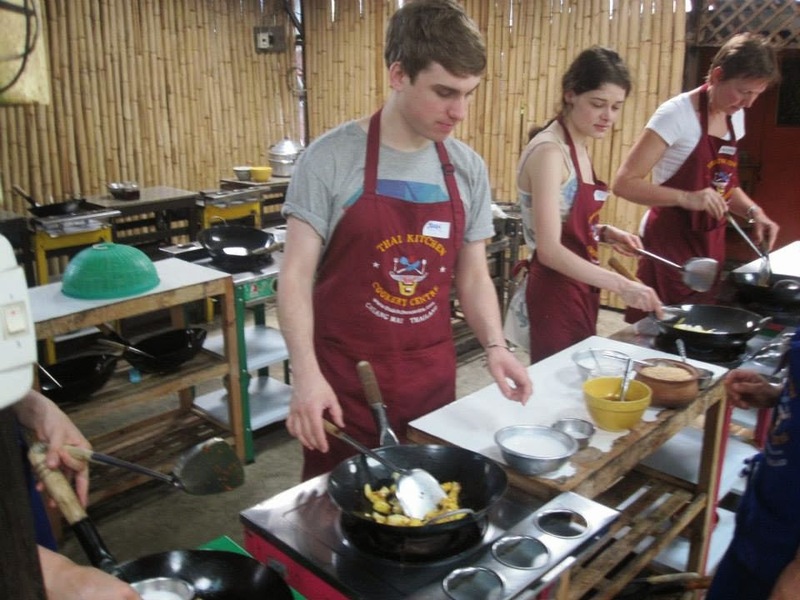 One of the highlights of our time in Chiang Mai was a half day cookery course. We booked with Thai Kitchen Cookery Centre, who were friendly and well priced. There are many great cookery schools to choose from, with practically everyone we spoke to having booked a different cookery school! We learnt to cook a soup dish, a curry dish, a curry paste and a stir fry dish. I'm a vegetarian and all courses were easily adapted to be meat-free. After being picked up from our guest house and then taken to the cookery school to meet the other recruits, we headed to a local market. A young Thai girl who spoke perfect English showed us around the market and told us a bit about lots of exotic fruits and vegetables and other ingredients that went into the food we'd be cooking. We then headed back to the cookery school and were split up into different small groups for each course, based on what we had chosen to cook. The instructions were well explained and we cooked some absolutely delicious food. We sat down and ate it after each course and met some lovely people during the day, who we met up with afterwards for drinks and market shopping. We were also given a lovely printed recipe book, to help us recreate the delicious food in the future. Since we've been back in the UK, we've already cooked some yummy Thai food for some friends. 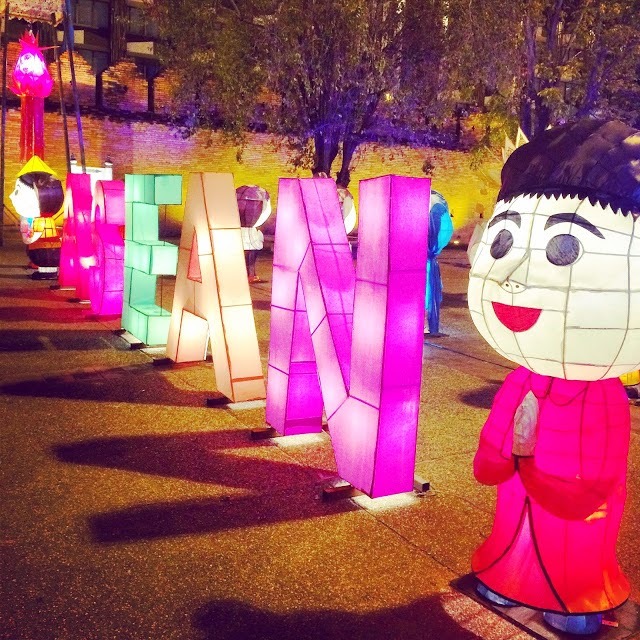 Chiang Mai has two famous night markets: The Saturday Walking Street Market and the Sunday Walking Street Market. Both are in separate locations. The Saturday market is a little more touristy, but with lots of lovely things to buy, many of which are handmade locally. The Sunday market has many of the same stalls as the Saturday market, but is even lovelier than the previous days market and just has a lovely feel about it. Both markets are very busy and also have lots of tasty food stalls. The Sunday market food was particularly nice and the many food area is in the grounds of one of the wats, which was a very pleasant place to sit and eat our dinner. Chiang Mai was a beautiful and friendly place to visit. 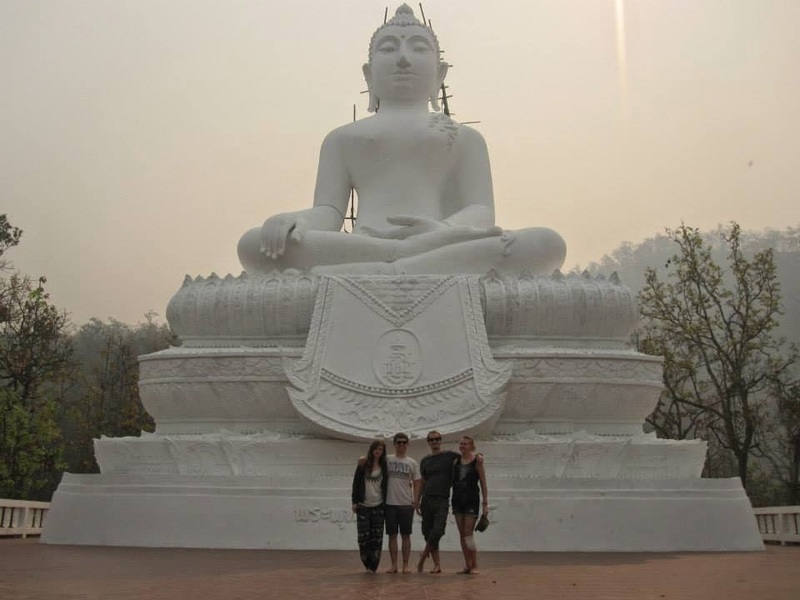 We visited for seven days initially, before heading to Chiang Rai and returning to Chiang Mai for two more days. We also visited a third time after a week in Pai. We'd definitely return again and I'd highly recommend you put Chiang Mai on the top of your list of places to visit in Thailand. You can read my previous post about Bangkok here. 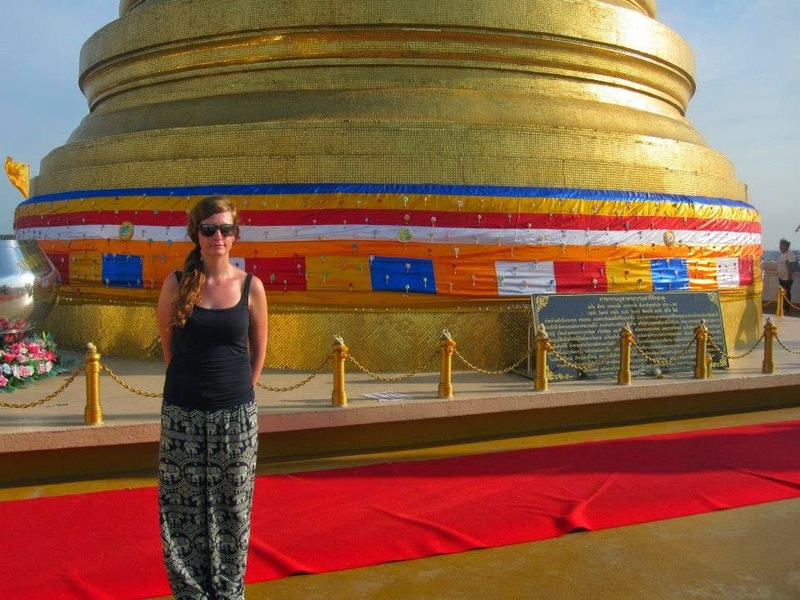 My girlfriend Emily and I recently spent eight weeks travelling around Thailand. Over the course of this month, I'll be writing a series of posts about our experiences in this beautiful country. We flew in to Bangkok via Dubai with Emirates on the 27th February. This was my first ever long haul flight and I definitely wasn't prepared for the lack of sleep and discomfort in cattle class! On arrival, after a lengthy queue at immigration, we got a taxi straight to Khao San Road, which is the main backpacker and tourist area of this bustling city. We arrived carrying only small hand luggage and immediately had to start buying essentials from the market stalls, as the airline lost our bags somewhere during the stopover in Dubai. Without boring you with the details, we eventually got our bags back five days later and had an all round terrible customer experience with this airline. 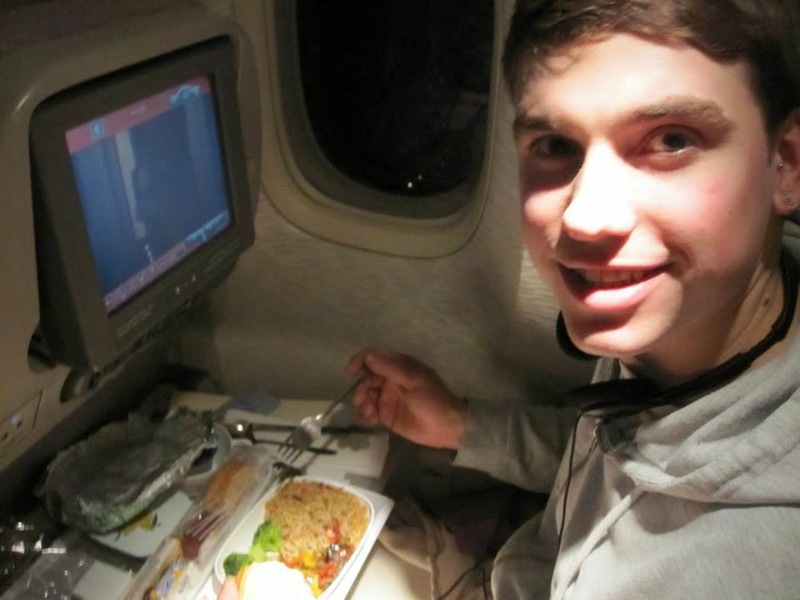 I should mention that we got a small amount of compensation from Emirates, after pursuing this. We checked in at Rikka Inn on Khao San Road, which we had booked in advance, to ensure we had a decent hotel to stay in when we arrived. This was a lovely hotel for our first few nights in Thailand, with clean, air conditioned rooms and a lovely rooftop pool. The staff here were really lovely and helpful. Whilst adjusting to the heat and time difference, we went for a wander around the area on our first night and bought our first Thai dinner from a street vendor: a big helping of Pad Thai. This is one of the main meals on offer everywhere we went in Thailand, however we found that Thai people rarely eat this, it's just something that was created for tourists and is seen as a traditional Thai dish by foreigners. We also relaxed whilst having a traditional Thai foot massage, which was lovely after the two long flights from the UK! Foot massage on Khao San Road. Evidently Em's masseuse didn't like the smell of her feet! Khao San Road is very busy and very touristy, with vast amounts of horribly tack knock-off goods and loud music pumping from various dodgy looking bars and restaurants. We quickly discovered that one street over lies Rambuttri Street, which is still very lively, but much cleaner and more interesting. 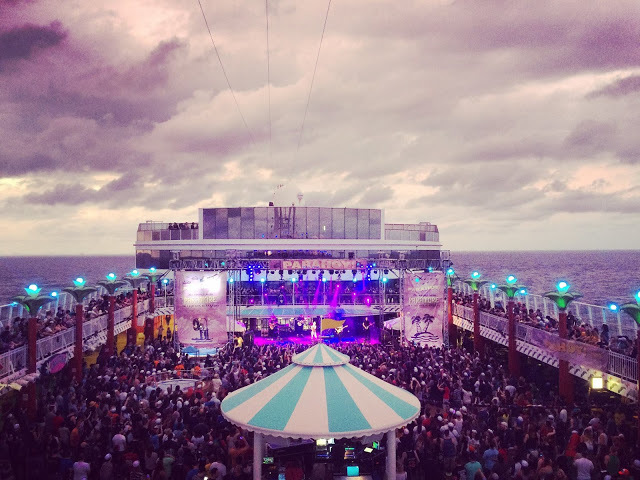 Here we found lots of great places to eat and drink, along with plenty of great evening entertainment. I'd definitely recommend checking-in to one of the many guest houses on this road if visiting Bangkok, as they're well located, but cheap and quiet late at night, as we found when we stayed on this street later in our trip. During our few days in Bangkok, while we were waiting for our bags from the airline, in order to be able to move on to Chiang Mai in the north of the country, we visited several tourist and cultural attractions. A useful tip to know if you are visiting Bangkok, is that the tuk-tuk drivers get free gasoline from the government, if they take you to the Tourism Authority of Thailand [TAT] office. Although this office only gives advice and you don't need to buy anything, all tuk-tuk drivers are hell-bent on taking you on a tour of the area, whilst trying to trick you into visiting the TAT office. 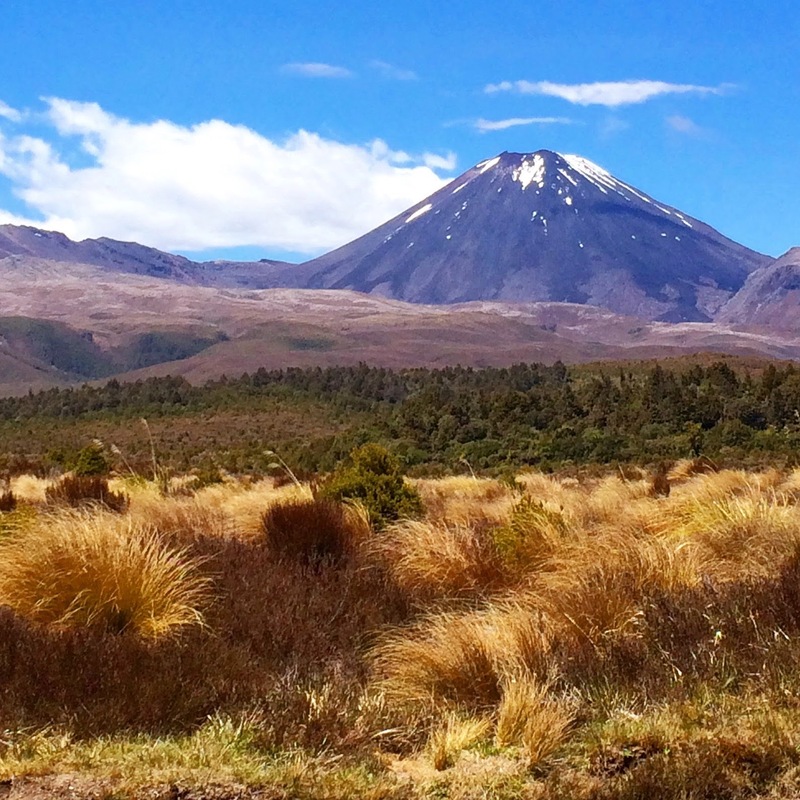 They'll offer you an insanely cheap price for an hours tour, but you must stop at this office. We were adamant that we did not want to stop at this office, and still managed to negotiate a reasonable fee. 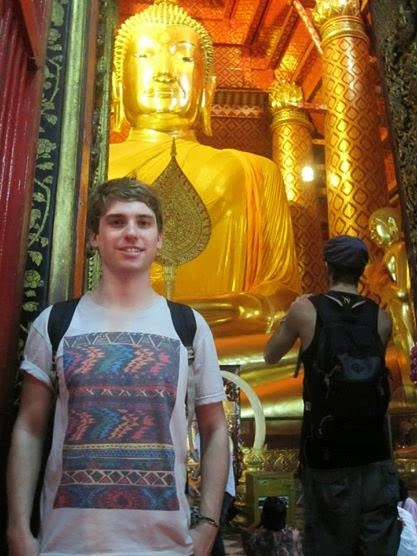 We visited the 'Giant Buddha', which is very large indeed, set in a bustling wat [temple] in the centre of Bangkok. We also visited a few of the other impressive wats in the locality, all of which were beautiful and gave us our first glimpse of Buddhist culture. 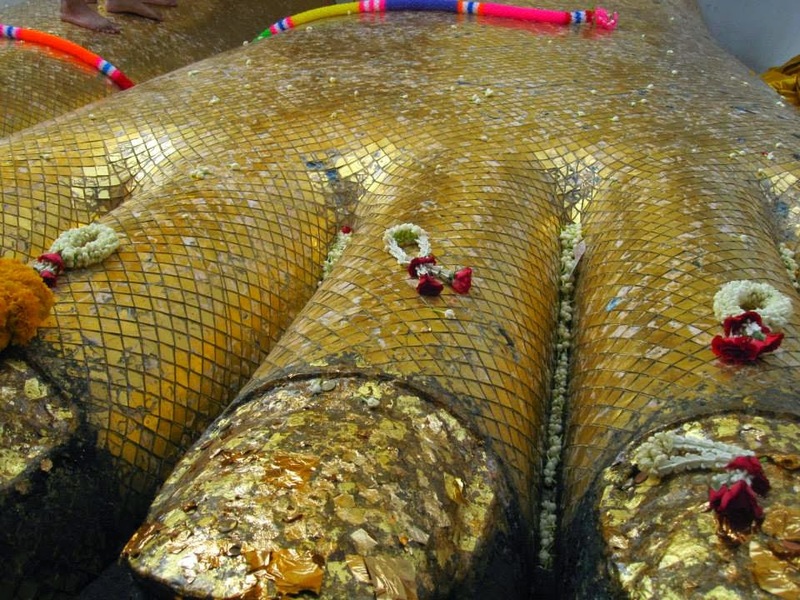 Giant foot of the Giant Buddha! We spent a long time exploring The Grand Palace, which is the official residence of the beloved King and Queen of Thailand. In the grounds of The Grand Palace lies the Queen's fabric museum, displaying many items of clothing she made herself. Emily loved it and I found it surprisingly quite interesting! Modesty must be observed in Thailand in general, and moreso in Buddhist wats. Girls must cover their shoulders and chest, so Emily carried a sarong around with her for our whole trip, in case of any unplanned wat trips! 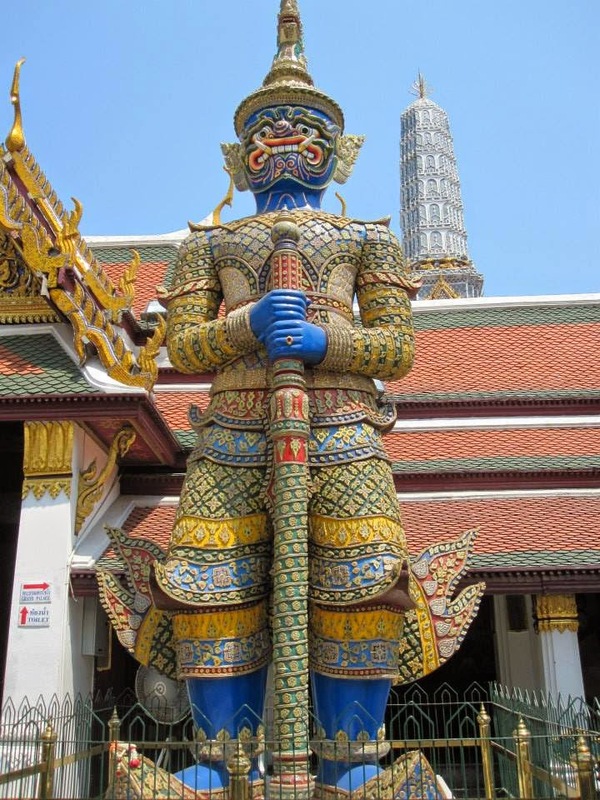 The Grand Palace rules are stricter, refusing entry unless both males and females have their shoulders properly covered with an item of clothing - a sarong or shawl is not enough. Knees must also be covered. 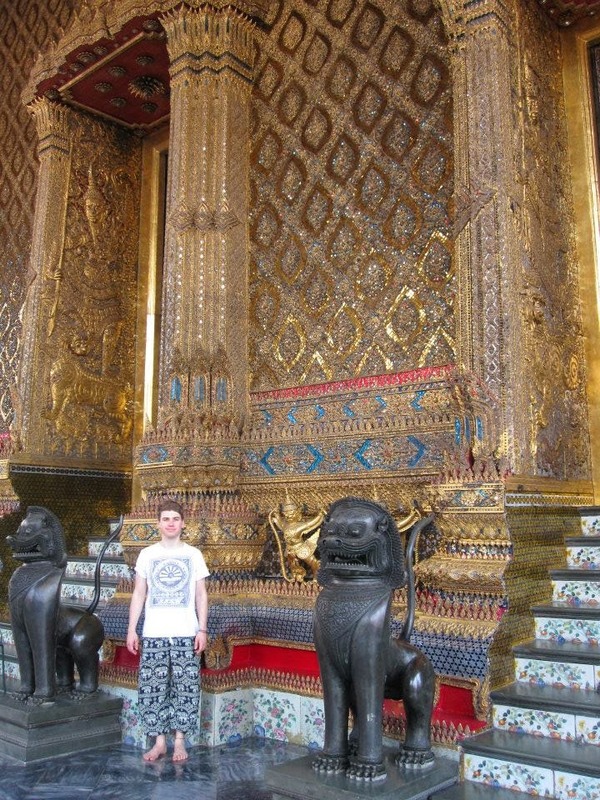 So Emily and I wore rather a strange selection of clothing whilst in The Grand Palace, with the clothing we had with us! show quite how impressive it is in size and beauty. On our last day in Thailand, we planned our time so that we could buy gifts for friends and souvenirs for ourselves in Bangkok, before flying home late at night. Although we got everything we wanted, I'd definitely recommend buying as much as you can as you travel around the country, even if you have to post items home. The postal costs are pretty reasonable and there are definitely much nicer places to buy nice things than Bangkok. We also allowed ourselves some time for one last cultural trip before our flight home. We climbed the 400 steps to the top of the Golden Mount [Wat Saket], which is an impressive Buddhist temple, which overlooks the whole city from the top. The views were very impressive and it was a lovely way to end an incredible eight weeks in this incredible country. On this final day, we also visited Shoshana: an amazing falafel restaurant that we read about in the Lonely Planet travel guide. We ate here all three times we visited Bangkok and can't rate it highly enough. 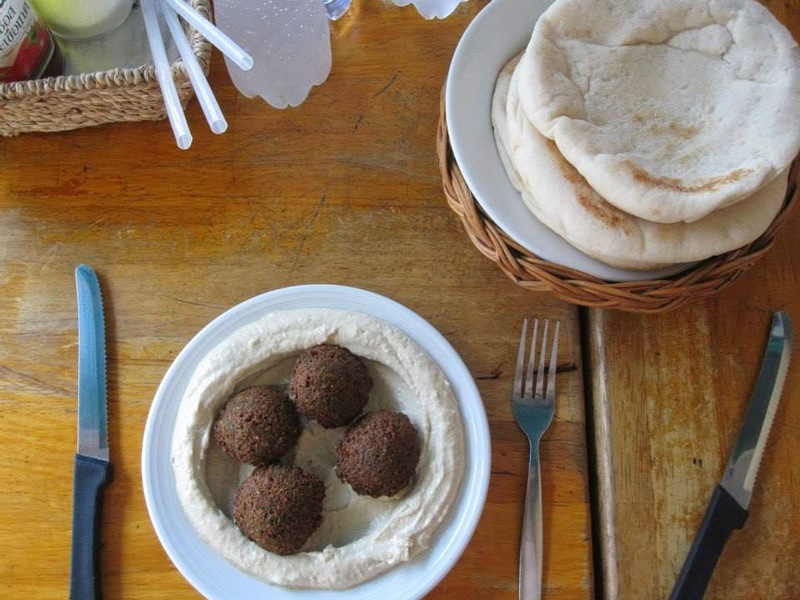 Super tasty, super simple and super cheap falafel. Food of [vegetarian] winners! The Lonely Planet travel guide was incredibly useful during our trip, giving us excellent and comprehensive information about what to see, where to stay and where to eat. I'd highly recommend Lonely Planet travel guides and wouldn't buy another brand after finding these so great. I'll be posting my next Thailand blog post in a few days, about Chiang Mai; Thailand's 'second city' in the North of Thailand.